A few weeks back I connected with my third cousin, once removed, Sue Jacobson. Sue is the granddaughter of Milton Goldsmith, and I had been hoping to connect with her for a long time. 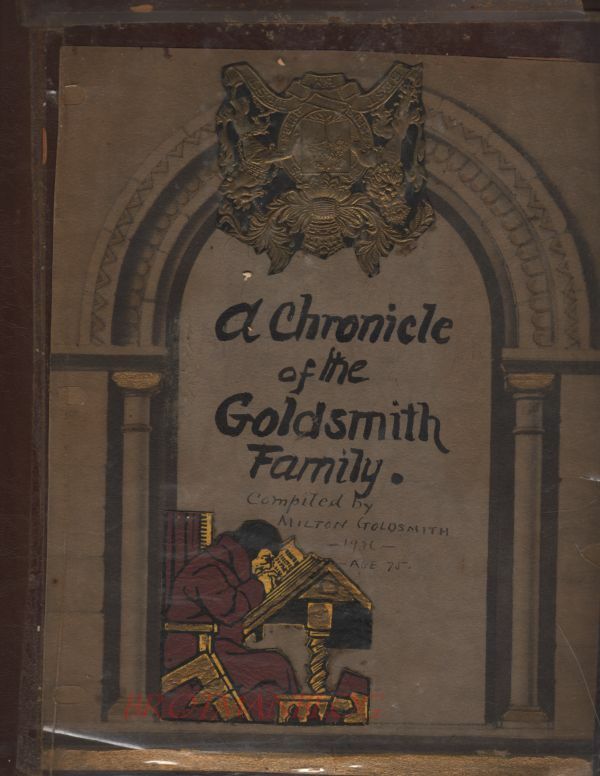 Some of you may remember the long series of posts I wrote about my cousin Milton Goldsmith, the author. Milton, the son of Abraham Goldsmith, was my great-grandmother Hilda Katzenstein’s first cousin; both were the grandchildren of Seligmann Goldschmidt and Hinka Alexander. 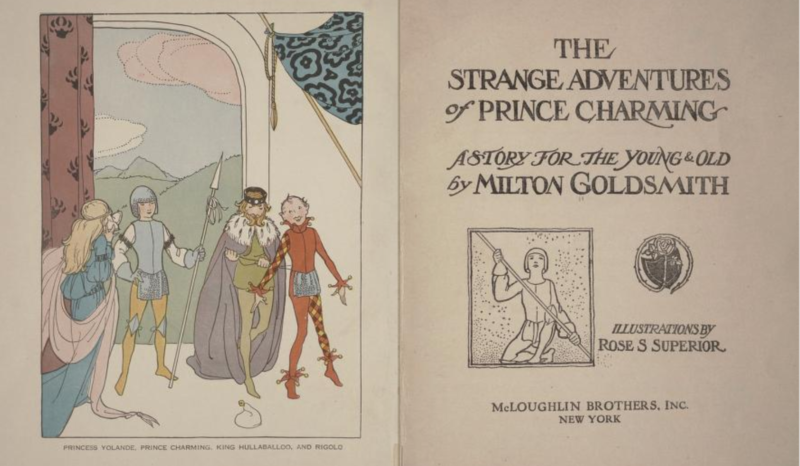 And my father recalled meeting Milton when he was growing up, remembering him as the author of children’s books. So I was fascinated by Milton and his life for many reasons, and finding Sue has been a true gift. 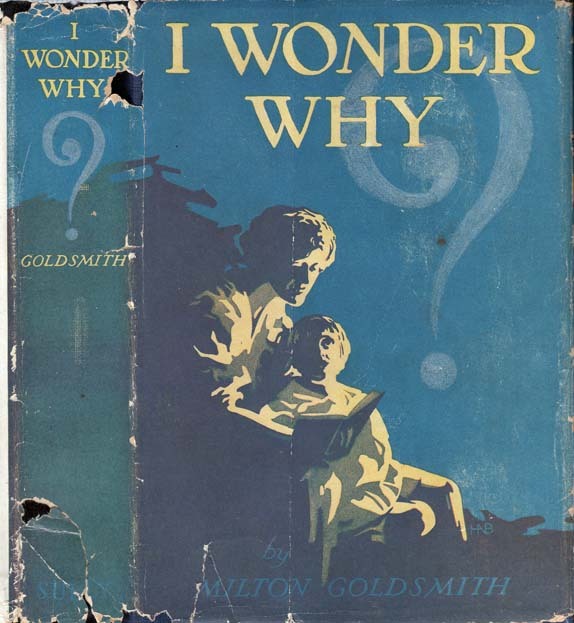 Not only has Sue answered some of my lingering questions and commented on my blog posts to update and respond to those questions, she has shared with me an incredible album that her grandfather Milton compiled in 1936 when he was 75 years old. It includes biographical information, some photographs, and family trees created by Milton. Sue has generously given me permission to post images from this album, and I have decided to add a third day a week to my blogging schedule to post this wonderful material a page or two at a time. I plan to post these each Monday, keeping my regular posts on Tuesdays and Fridays. 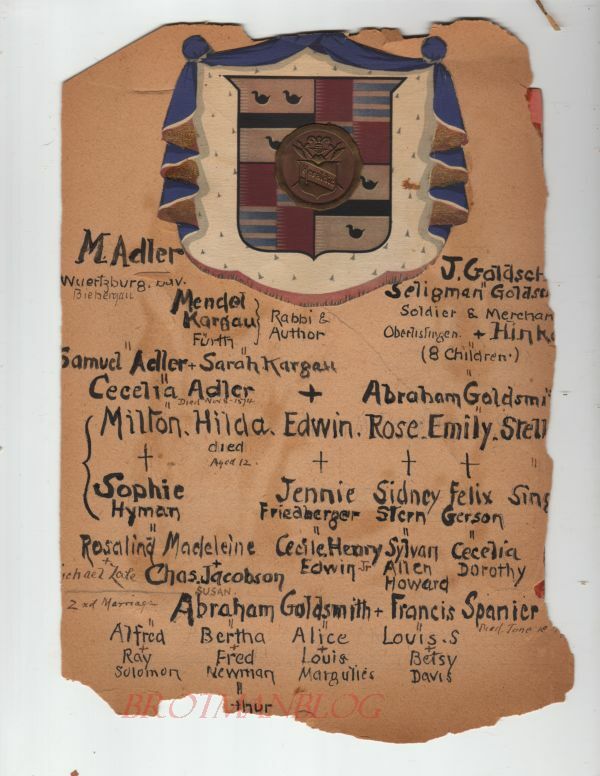 Today I am posting the cover of the album and its inside cover, which is a beautiful rendition of Abraham Goldsmith’s family tree, showing all his children and grandchildren from both his first marriage to Celia Adler and his second marriage to Frances Spanier. I am very curious about the illustrations. Did Milton buy this album with the illustrations already printed on the cover and on the pages that follow? Or did he have someone do these illustrations? They look not dissimilar to some that appeared in his books. Has anyone ever seen an album like this before? 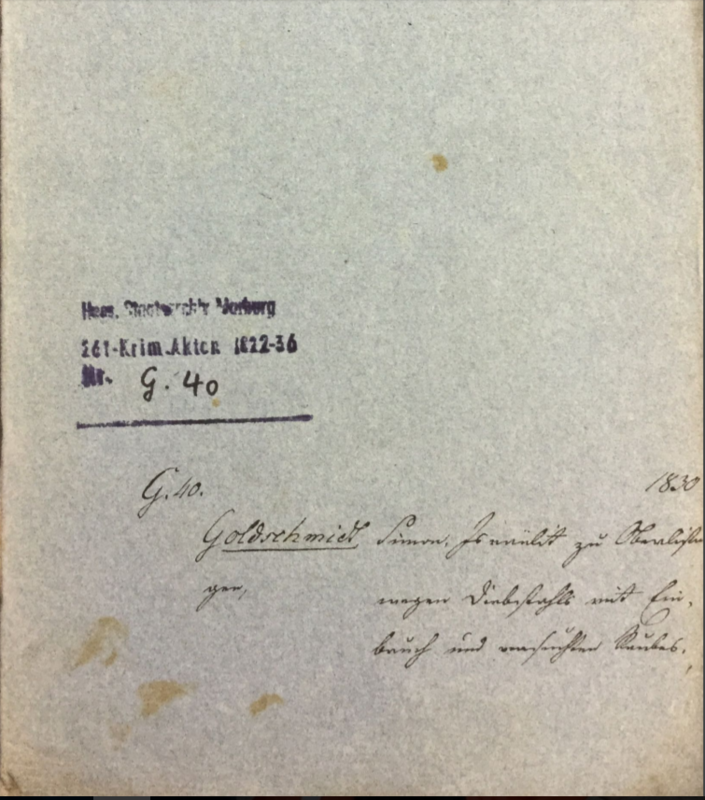 Next time I will post the page that follows these in the album where Milton reported on the children of Seligmann Goldschmidt, his father’s father. I was delighted that Milton’s report corroborated the research I had done on Seligmann’s family. But I was even more delighted when I learned about a cousin I had not known about before. I am excited to share that discovery next week. Stay tuned. Before my break, I noted that I had finished writing about the descendants of Seligmann Goldschmidt and Hinka Alexander, my three-times great-grandparents, and the descendants of Seligmann’s brother, Lehmann Goldschmidt. Now I would like to turn to Seligmann’s youngest sibling, Simon Goldschmidt, whose story I’ve already told in bits and pieces at other times because his second wife, Fradchen Schoenthal, was the sister of my Schoenthal great-great-grandfather Levi Schoenthal, and because one of his grandchildren, Ella Bohm, married my great-great-uncle Jacob Katzenstein. In May, 1826, Simon was charged with burglary and attempted robbery.2 As I wrote about at length in this post, in 1830 there was a trial, and Simon was convicted and sentenced to ten years in prison with his legs shackled. Simon appealed, and on December 24, 1830, the appellate court upheld the verdict, but reduced the sentence from ten years to four years because the victim’s injuries were not dangerous or life-threatening and because Simon had not used any lethal weapons. The court also observed that the delay in trial was not Simon’s fault and took that into consideration in reducing his sentence. 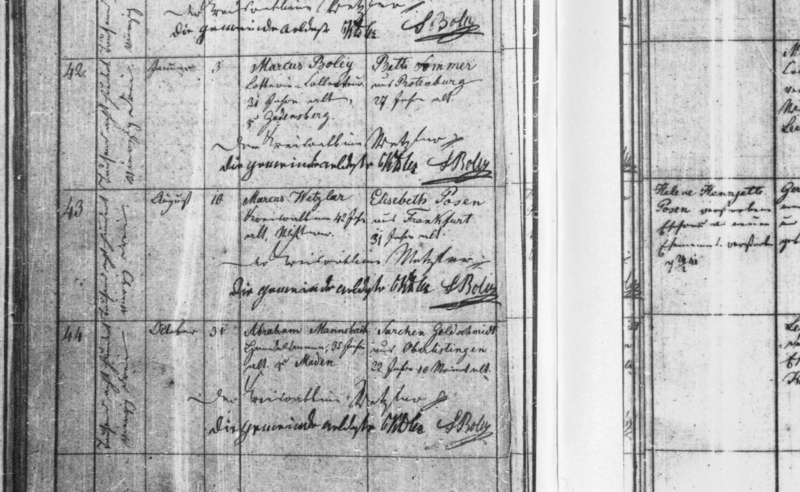 Simon and Eveline had four more children after Jacob: Lena (1828),3 born while he was awaiting trial, and three born after he was released, Hewa “Eva” (1836), Joseph (1837), and Jesajas (1839), all born in Oberlistingen. Sadly, Simon and Eveline’s last two babies did not survive. Both Joseph and Jesajas died in infancy. A year after the death of Jesajas, Simon’s wife Eveline died on August 19, 1840. Simon was left on his own to raise his fifteen-year-old son Jacob, twelve-year-old daughter Lena, and four-year-old Eva. 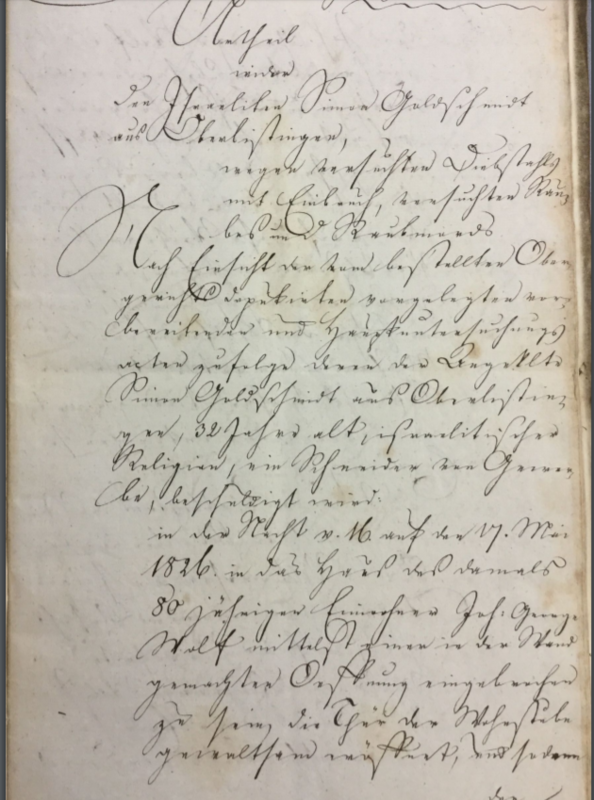 Simon’s son Jacob left Germany that same year and immigrated to the US.4 By 1850, Jacob was living in Washington, Pennsylvania, working as a tailor and living with two other men who were tailors, and had changed his surname to Goldsmith. 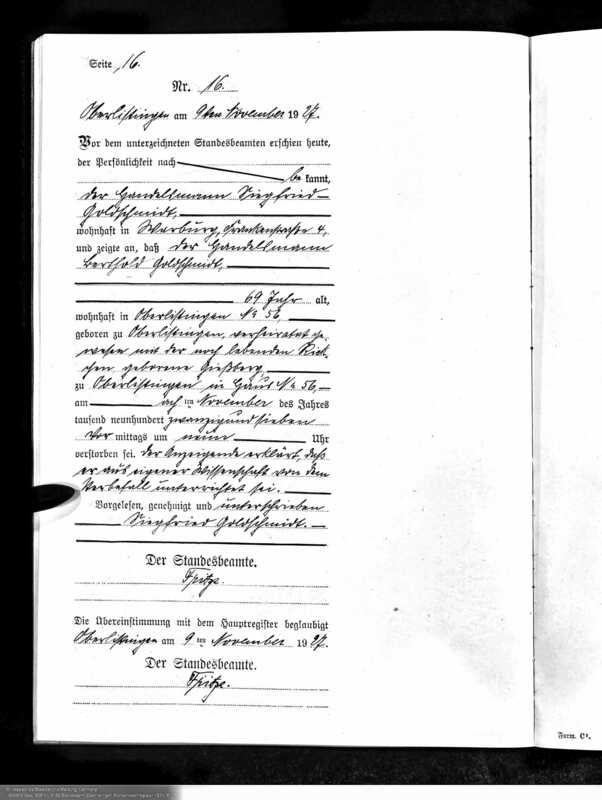 On September 10, 1844, Simon married Fradchen Schoenthal, my three-times great-aunt, in Oberlistingen. Fradchen was already 37 at that time, and Simon was 49. Almost exactly a year later, Simon and Fradchen arrived in the United States along with Simon’s youngest daughter, Eva, who was then nine years old. They must have settled first in Baltimore because Simon and Fradchen had two children who were born there, Henry on January 10, 1847,5 and Hannah on June 5, 1848.6 Since Henry and Hannah’s mother and father were both my blood relatives, they are my double cousins: first cousins, three times removed through Fradchen, and first cousins, four times removed through Simon. 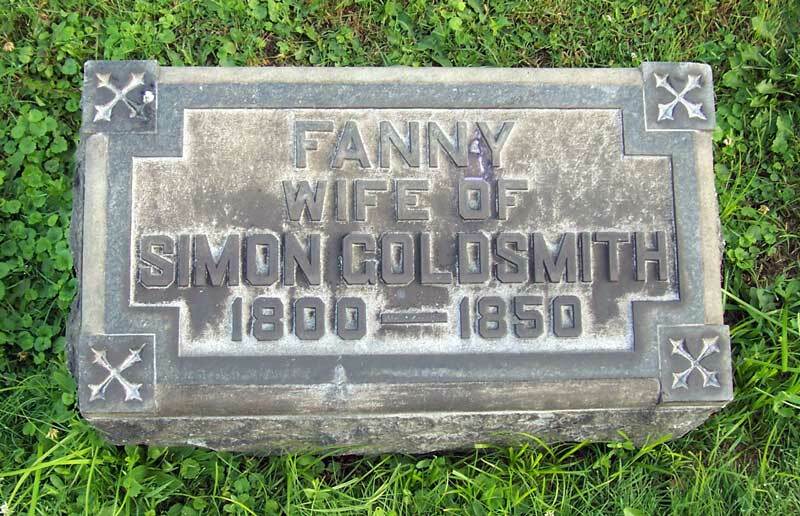 By 1850, Simon and Fradchen (also known as Fanny) were living in Pittsburgh with Henry and Hannah as well Simon’s two daughters from his first marriage, Lena and Eva. Simon was working as a tailor and had, like his son Jacob, Americanized his surname to Goldsmith. Simon lost his second wife Fradchen soon thereafter; she died on August 11, 1850, at age 43. Once again Simon was left with young children—Henry was three, Hannah was two. By 1853, Simon’s son Jacob had married Fannie Silverman, also a German immigrant, and together they had six daughters born between 1853 and 1860: Ellena (1853)7, Emma (1854),8 Annie (1855),9 Rachel (1857),10 Leonora (1858),11 and Celia (1860).12 By 1860, Simon and his two youngest children, Henry and Hannah, had moved to Washington, Pennsylvania, and were living with Jacob and Fannie and their six daughters. Henry and Hannah were only five and six years older than their oldest niece, Ellena. Simon’s daughter Lena married another German immigrant, Gustavus Basch in 1856.13 In 1860, they were living in Connellsville, Pennsylvania, with their first two children, Frank (1858) and Jacob (1859). Connellsville is under fifty miles from Washington, Pennsylvania, where Lena’s father Simon and her brother Jacob were then living. As for Simon’s youngest child with Eveline, his daughter Eva, her whereabouts in 1860 are unknown. I cannot find her anywhere on the 1860 census. More on Eva here and here and in a subsequent post. Thus, by 1860, all the members of the family of Simon Goldschmidt (except possibly Eva) were living in western Pennsylvania, most of them in Washington, Pennsylvania. That was as far as I’d gotten with Simon’s story in my earlier posts. Now I can pick up with Simon and his children in the years after 1860. 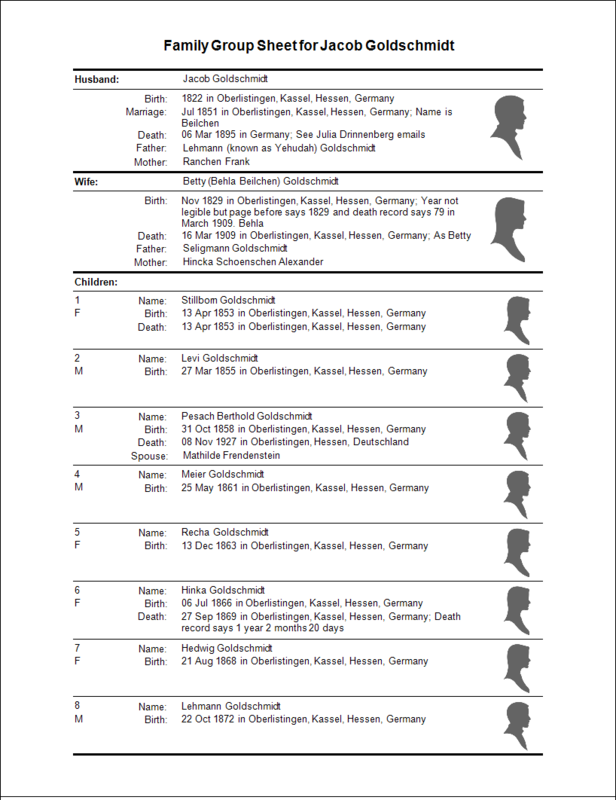 As seen in the last post, six of the seven children born to Berthold Goldschmidt and his wife Mathilde Freudenstein died early in life, including their son Leopold, who was killed in World War I fighting for Germany. The only child who one survived to adulthood was their youngest son Siegfried. The correctness with the main register is herewith certified. Siegried married Fanny Frieda Pless on April 18, 1922, in Frankfurt, Germany. Fanny Frieda was born on August 6, 1895 in Zachan, then part of Germany in the Pomeranian region, but today known as Suchan in Poland. As Siegfried and Fanny Frieda were married in Frankfurt, I assume that Fanny Frieda’s family must have relocated to Frankfurt sometime after her birth. 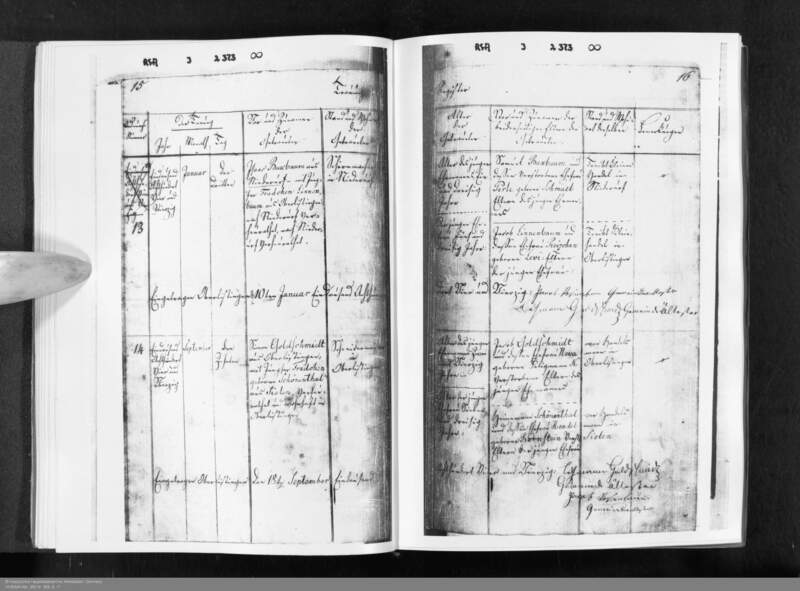 According to the marriage record (also generously translated by Matthias Steinke), Siegfried was living at the time in Holzminden and Fanny Frieda in Frankfurt. Holzminden is about 180 miles north of Frankfurt and 36 miles north of Oberlistingen where Siegfried was born. How did Siegfried meet Fanny Frieda, a woman born far from where he was born and living far from where he lived? I don’t know. The registrar asked the engaged couple one after another whether they want to marry each other. After both confirmed this question, he declared, that they are from now on a legally married couple. This order was cancelled by the registrar at the 24th July 1949. Tragically, Siegfried and Fanny Frieda were both murdered in the Holocaust. They were deported to the Warsaw Ghetto in 1942 and killed sometime thereafter.2 These are the first Goldschmidt family members I’ve located who died in the Holocaust, but I fear not the only ones. I just haven’t yet found the others. Given that Siegfried’s brother Leopold had died fighting for Germany in World War I, Siegfried and Fanny’s deaths are that much more painful and infuriating. The cruel irony and immorality of that just leave me stunned. 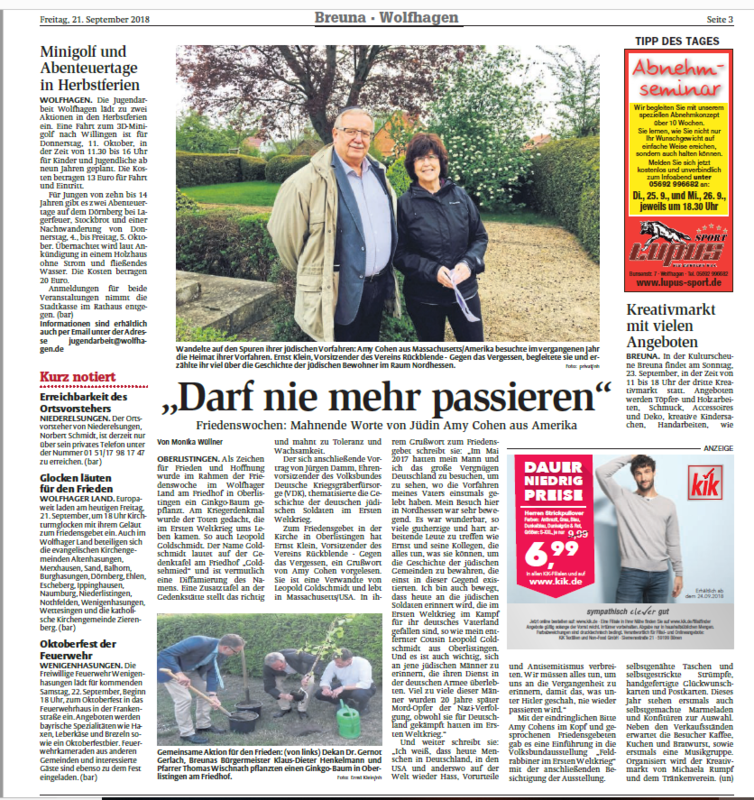 Recently I had an opportunity to make that point to the Goldschmidts’ hometown, Oberlistingen. Back in September, I was contacted by my friend Ernst Klein, who had been our guide in Volkmarsen, Breuna, and Oberlistingen back in 2017. Ernst told me that he was involved in planning an event to take place in Oberlistingen to commemorate the Jewish soldiers who fought for Germany in World War I. He asked whether I would be willing to write some remarks to be read at the ceremony since my cousin Leopold Goldschmidt was being honored at the ceremony. When Ernst told me that Leopold had been killed in World War I, it was new information for me as I had not yet found any record of Leopold’s death. Nor did I then know what had happened to Leopold’s younger brother Siegfried. How I wish I had known what I now know about Leopold and Siegfried so that I could have made my remarks more personalized and specific. Instead I drafted some general remarks and sent them to Ernst. Caption under picture: Changed in the footsteps of her Jewish ancestors: Amy Cohen of Massachusetts/America visited the home of her ancestors last year. 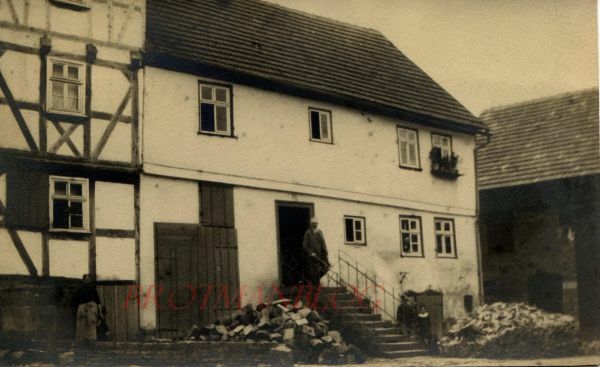 Ernst Klein, chairman of the association Flashback-Against Forgetting, accompanied her and told her a lot about the history of the Jewish inhabitants in the area of North Hesse. OBERLISTINGEN. As a sign of peace and hope, a ginkgo tree was planted as part of Peace Week in Wolfhager Land at the cemetery in Oberlistingen. The war memorial commemorated the dead who died in the First World War, including Leopold Goldschmidt. The name Goldschmidt is on the plaque at the cemetery as “Goldsehmied” and is probably a distortion of the name. An additional plaque at the memorial calls for tolerance and vigilance. The lecture by Jürgen Damm, Honorary Chairman of the Volksbund German War Graves Welfare (VDK), addressed the history of German Jewish soldiers in the First World War. “In May 2017, my husband and I had the great pleasure of visiting Germany to see where my father’s ancestors once lived. My visit here in northern Hesse was very moving. It was wonderful to meet so many kind-hearted and hard-working people like Ernst and his colleagues who do everything they can to preserve the history of the Jewish communities that once existed in this area. 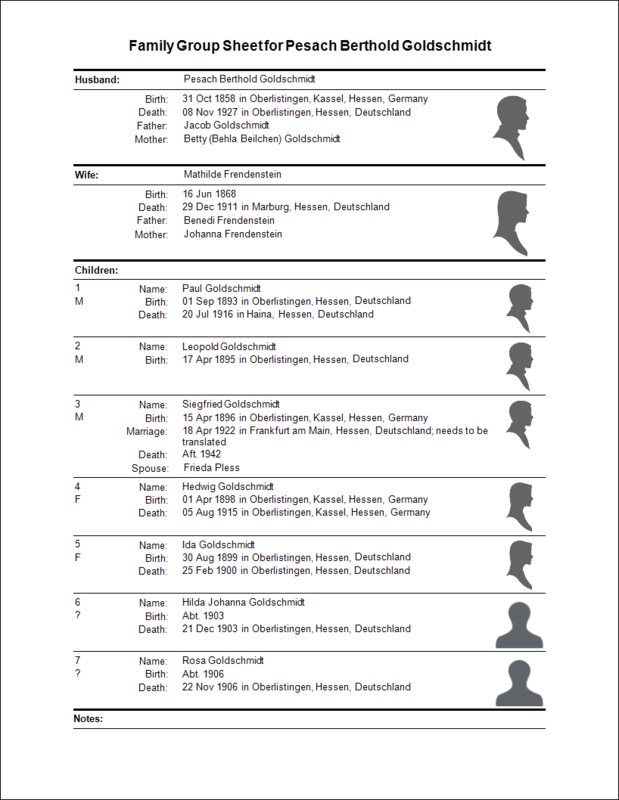 I am also moved that today people are reminded of the Jewish soldiers who fell in the fight for their German homeland in the First World War, as did my distant cousin Leopold Goldschmidt of Oberlistingen. I am glad that I made that point about Jewish soldiers who fought in World War I becoming targets of Nazi terror, but I wish I could have told the specific story of Leopold and Siegfried instead. It would have been much more personal and more powerful. There was one bright light left for this family. Somehow Siegfried and Fanny Frieda’s only child, their young son Max, survived. His story in the next post. As seen in my last post, as far as I’ve been able to determine, of the eight children born to Jacob Goldschmidt and Betty Goldschmidt, only their son Berthold survived to adulthood. Hilda, Rosa and Ida all died before their first birthdays.8 Thus, of the seven children born to Berthold and Mathilde, it appears that only Paul, Leopold, Siegfried, and Hedwig lived past infancy. It must have been devastating for Berthold and Martha to lose three babies like that. Between 1895 and 1909, Berthold also lost his parents Jacob and Betty. Thus, he suffered five losses in a very short period of time. Then Berthold suffered four more tragic losses in the 1910s. First his wife Mathilde Freudenstein Goldschmidt died at age 43 in Marburg, Germany, on December 29, 1911. She left Berthold with four teenagers to raise alone. Paul was 18, Leopold was 16, Siegfried was 15, and Hedwig was 13. But Berthold’s heartbreak was far from over. 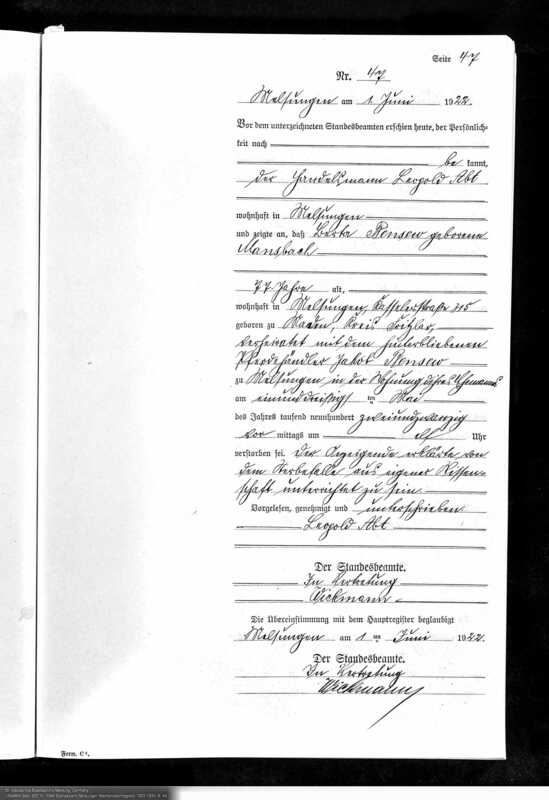 His daughter Hedwig died on August 5, 1915 in the Elisabeth hospital in Volkmarsen, as attested to by a nurse at that facility; she was only seventeen. 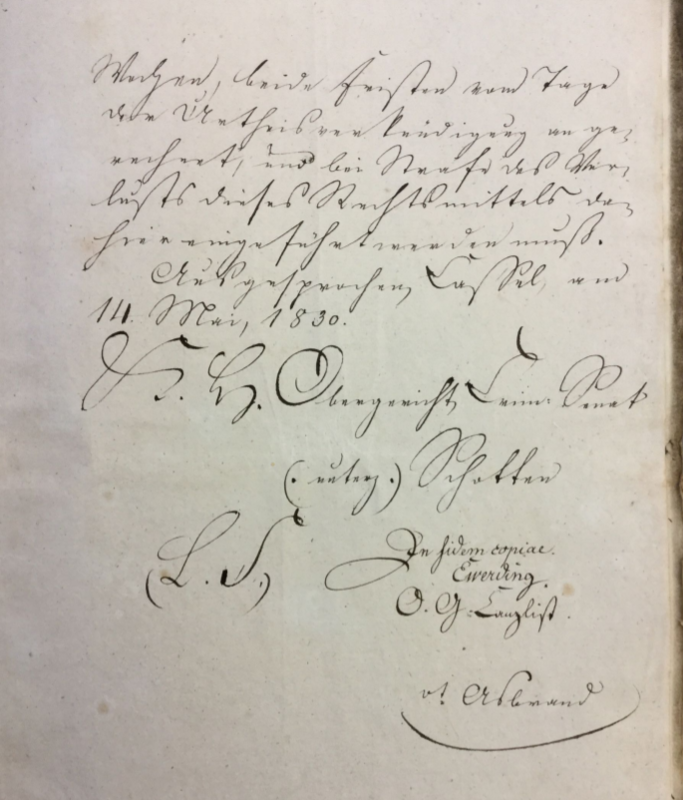 Matthias Steinke generously translated Hedwig’s death record, which reports that Hedwig had been residing in Oberlistingen at the time of her death. I have tried to find some document showing the cause of death, but have had no success. Less than a year after Hedwig’s death, Paul Goldschmidt, Berthold and Mathilde’s first child, died in the state hospital in Haina, Germany, on July 20, 1916, at age 22. 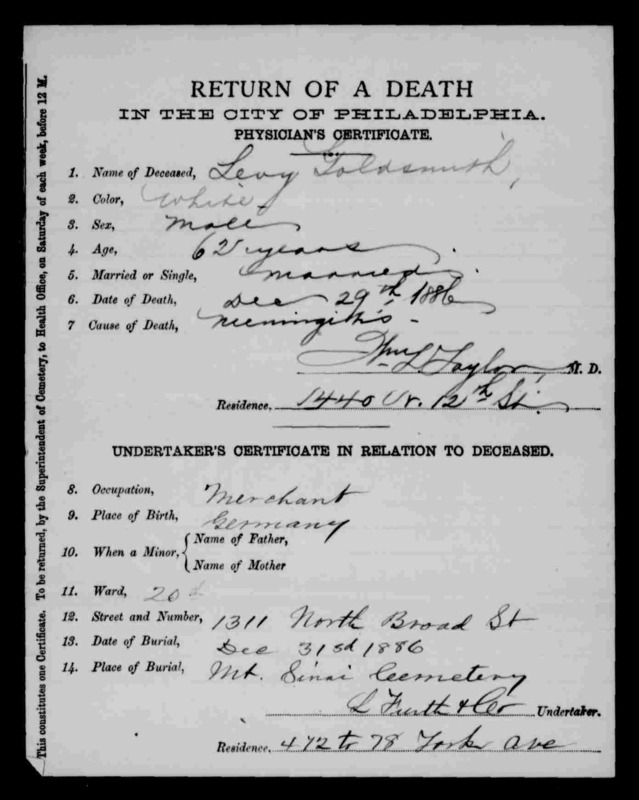 The death record did not reveal a cause of death or the duration of Paul’s time at the state hospital, and I wondered whether, given his age and the year, he had died as a result of injuries suffered fighting for Germany in World War I. At the age of four, Paul Goldschmidt fell ill with hydrocephalus. He was first treated at the “Idiotenanstalt” (idiot asylum) [in] Idstein. 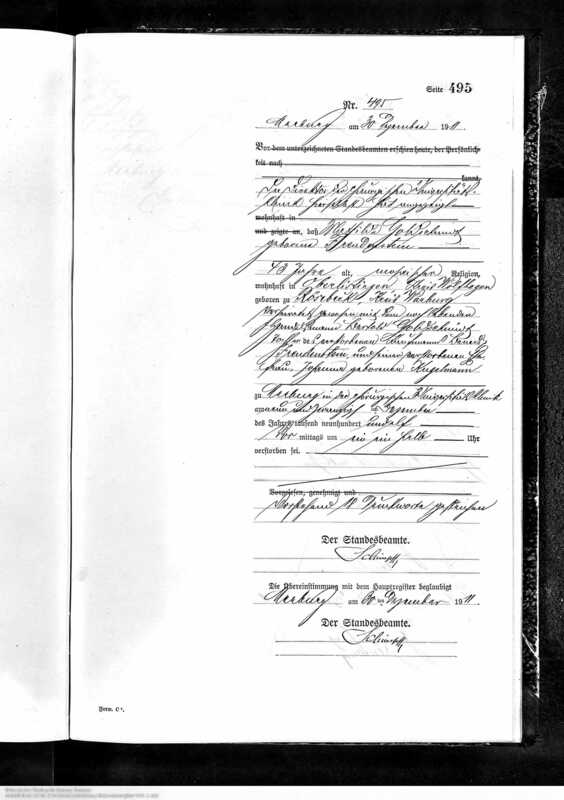 In November 1900 Paul was admitted to the “Hessisches Brüderhaus (Anstalten Hephata”) near Treysa. On September 23, 1914, he was transferred to Haina Hospital. There he died on July 20, 1916, of “Marasmus bei Idiotie”. 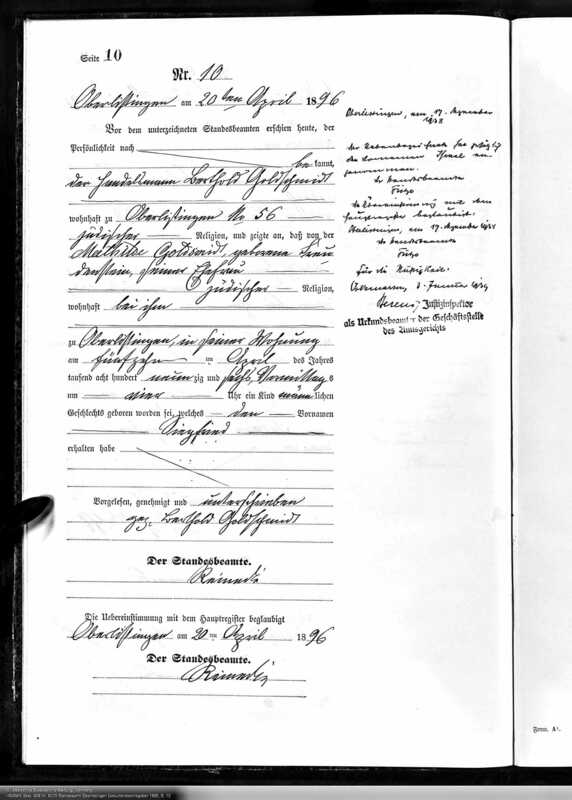 Dr. Hecker sent me the entire file, and although I have not been able to translate much of it that is hand-written, I was able to translate one type-written entry that revealed that Paul was developing normally until he was four. His parents attributed the hydrocephalus to a fall; Paul had hit his head on the corner of their stove and received four to five stitches. Whether that could cause hydrocephalus is beyond my area of expertise. But apparently soon thereafter his behavior and his development regressed, and he was institutionalized. How very sad that this boy spent eighteen years institutionalized before dying at age 22. UPDATE: My medical consultant tells me that it is extremely unlikely that hydrocephalus would have been caused by a fall. More likely it had been progressing. Perhaps the fall was caused by the hydrocephalus, not the other way around. On the other hand, one reader told me that her son had hydrocephalus caused when he was elbowed in the head, moving an undetected tumor in such a way as to cause hydrocephalus. Fortunately her son recovered after surgery removed the tumor. Thank goodness for modern medicine. But Berthold’s heartbreak was still not over. One of his two remaining children, his son Leopold, was killed just a few months after Paul’s death while fighting for Germany in World War I. He was only 21 years old. With the help of those in the Jekke group on Facebook, especially the incredibly generous help of Andre Gunther and Doris Benter of that group, I believe I have been able to piece together some of what happened to Leopold. Leopold was injured in the fall of 1915 while serving in the 12th Company of the Reserve Infantry Regiment, No. 256.9 He returned to active duty after recovering from these injuries, and in December 1916 he was listed as missing.10 As seen below, it was reported that he had been missing since the end of October in the West. At that time he had been serving with the 8th Company of Infantry Regiment No. 364, to which he must have been transferred when he returned to duty. In September, Gen. Charles Mangin, who had held command of a section of the French defensive line from Fleury to the right bank of the Meuse from June 22, proposed a scheme to liberate the Verdun region. Nivelle approved, and that offensive was initiated on October 21 with an artillery barrage across a broad front. An infantry assault followed on October 24, with three divisions advancing behind a creeping artillery barrage. By that evening the French had retaken Douaumont along with 6,000 German prisoners, and by November 2 the fort at Vaux was once again in French hands. According to other sources, the 364th Infantry Regiment was among those participating in the October 24 battle for Fort Douamont. Thus, Leopold likely participated in that action and was among the many German soldiers who were either killed or taken prisoner by the French during that battle. 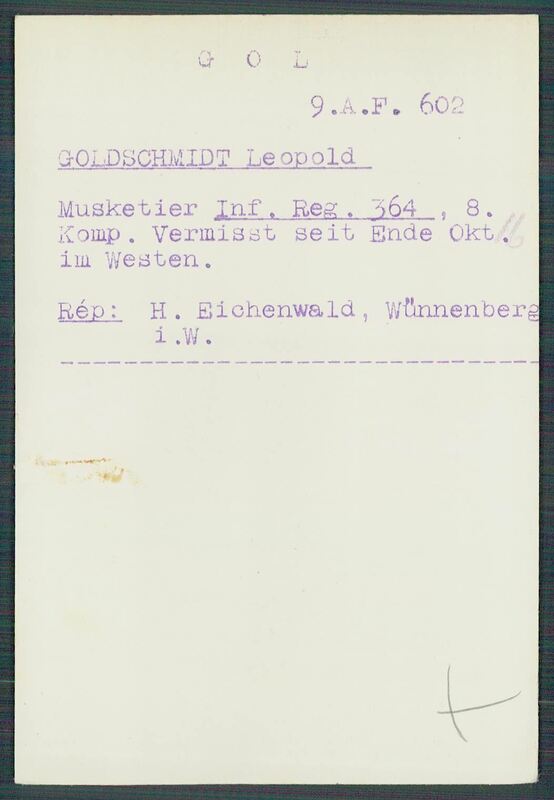 Leopold Goldschmidt died serving his German homeland in 1916. He was survived by his father Berthold and his only remaining sibling, Siegfried Goldschmidt. This fall his hometown of Oberlistigen honored his memory and his service to his country. More on that in the next post. Thus, by 1916, Berthold Goldschmidt had outlived his wife and seven of his eight children. It’s hard to fathom how someone endures so many losses. Berthold died in Oberlistingen on November 8, 1927, eleven years after his sons Paul and Leopold; he was 69 years old. 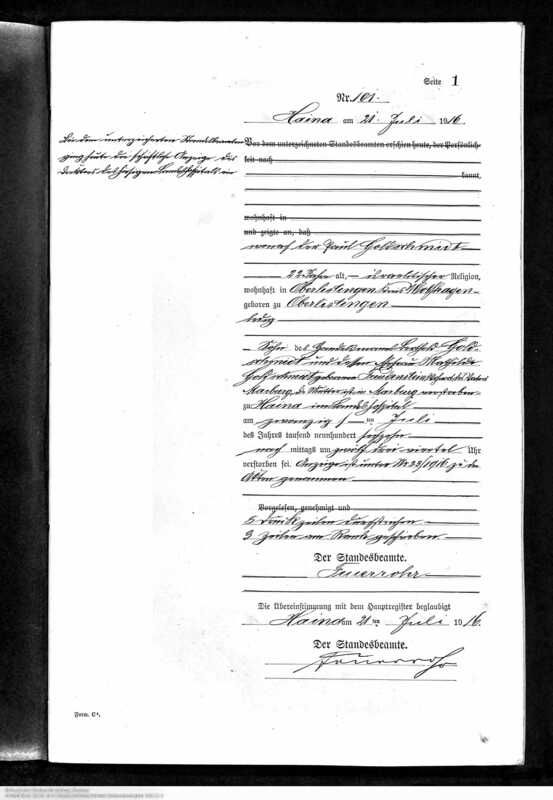 Siegfried Goldschmidt, the only child of Berthold and Mathilde still living, attested to his father’s death. As we will see, Siegfried’s life ended in tragedy as well. 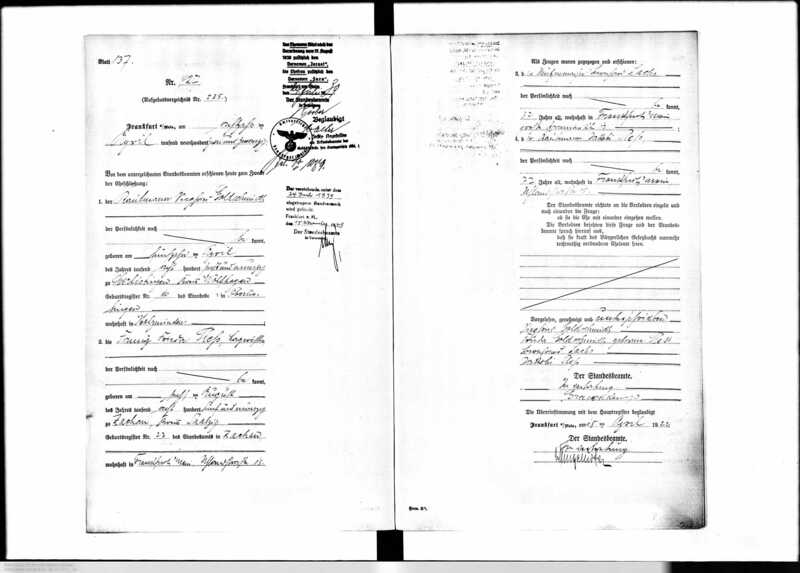 I have now written about all the children of my three-times great-grandparents Seligmann Goldschmidt and Hinka Alexander who immigrated to the US; their only child who did not immigrate was their daughter Betty (also known as Behla and Beilchen). She was born in Oberlistingen in November 1829, their third daughter and fifth child. Not only did Betty never leave Germany, she never lived anywhere but her birthplace of Oberlistingen because she married her first cousin, Jacob Goldschmidt, who was also from Oberlistingen. 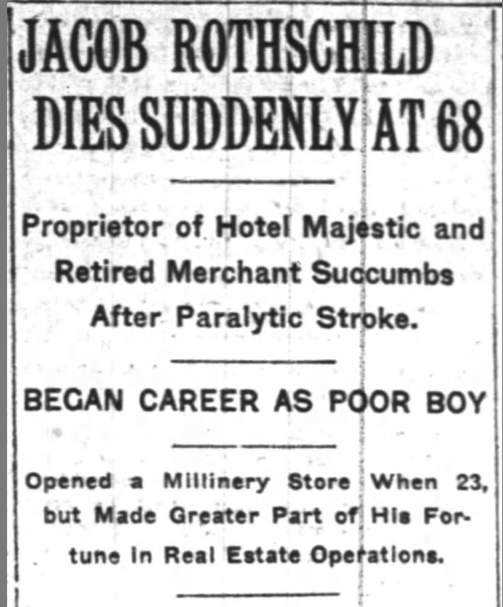 Jacob Goldschmidt was the son and apparently the only child of Lehmann Yehudah Goldschmidt and Ranchen or Rinia Frank. Lehmann Goldschmidt was the younger brother of Seligmann Goldschmidt, making Jacob and Betty first cousins. Lehmann was also my 4x-great-uncle, making Jacob my first cousin, four times removed. So I can in a sense kill two birds with the next set of posts: finish the story of the descendants of my three-times great-grandparents Seligmann and Hincka (Alexander) Goldschmidt and tell the story of Seligmann’s brother Lehmann Goldschmidt and his descendants. 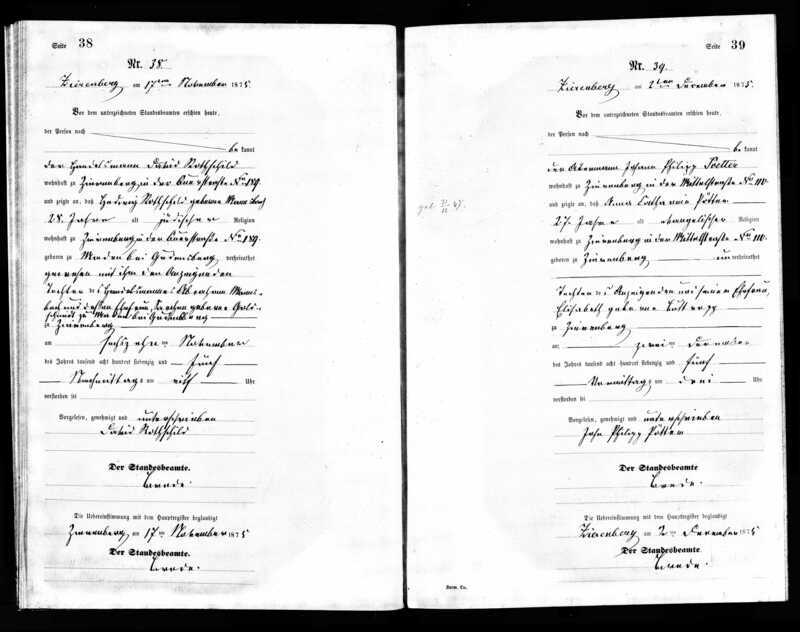 I could not find a birth record or marriage record for Lehmann nor for his wife Ranchen/Rinia, but only their death records. 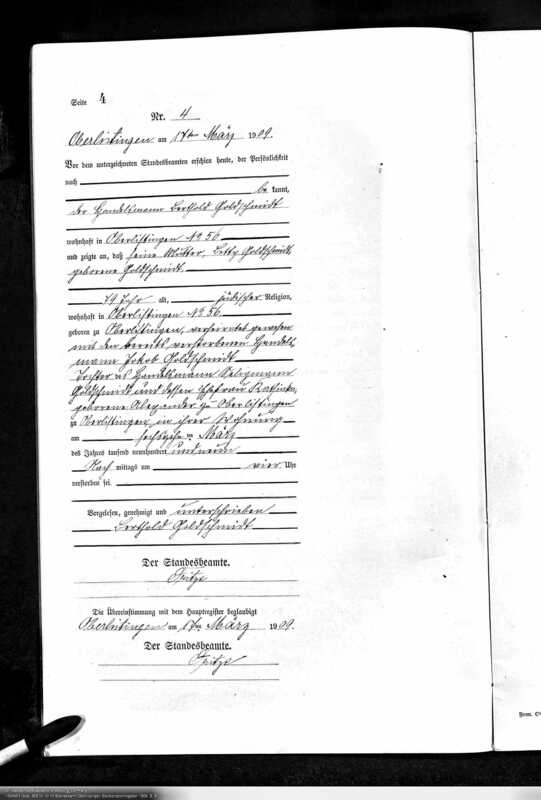 According to Lehmann’s death record, he was born in Oberlistingen and died there when he was 80 years old on July 15, 1865, meaning he was born in about 1785. His wife died in Oberlistingen on March 5, 1854, when she was 75 years, two months, and three days old, meaning she was born January 2, 1779. I don’t know, however, where she was born. 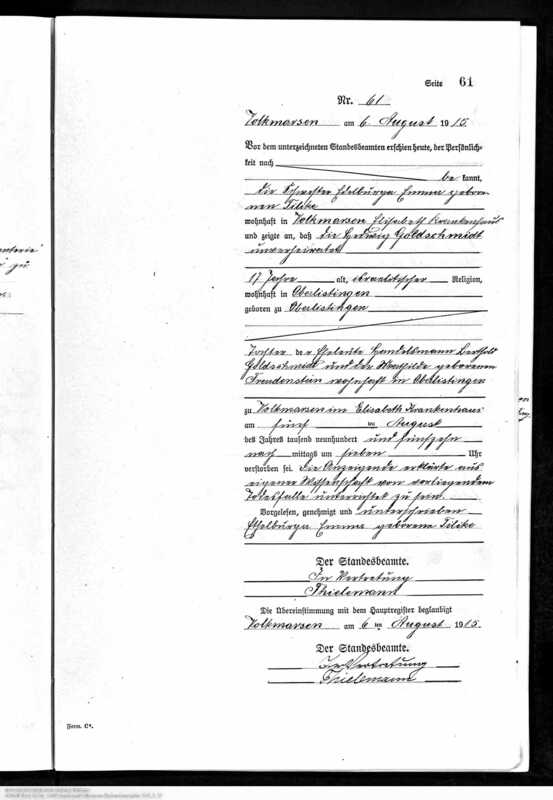 I also was not able to find a birth record for Lehmann’s son Jacob Goldschmidt. 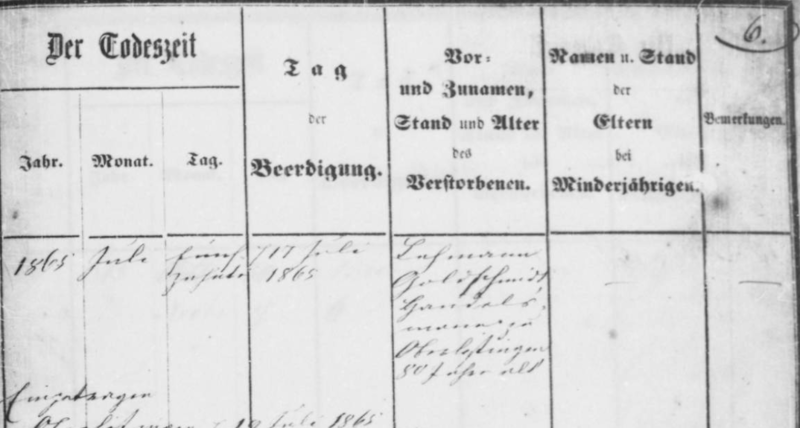 However, I was able to find the record of Jacob’s marriage to Betty Goldschmidt, which reports that Jacob was 28, Betty (Beilchen here) was 22 when they married in July, 1851 in Oberlistingen. That would indicate that Jacob was born in about 1823 and Betty in 1829, as is consistent with her birth record above. That means that Jacob’s mother was in her forties when he was born and may explain why he was their only child. The other seven children were Levi (1855),1 Pesach Berthold (1858),2 Meier (1861),3 Recha (1863, presumably named for Ranchen/Rinia Frank Goldschmidt, Jacob’s mother who died in 1854),4 Hinka (1866, presumably named for Betty’s mother Hinka),5 Hedwig (1868),6 and Lehmann (1872, presumably named for Jacob’s father, Lehmann, who died in 1865).7 I have birth records for all seven of these children, but unfortunately for five of them, those are the only records I can locate, and I have no information about what happened to them after their births. The only children for whom I have later records are Pesach Berthold and Hinka. Hinka died on September 27, 1867. She was only one year, two months, and twenty days old. 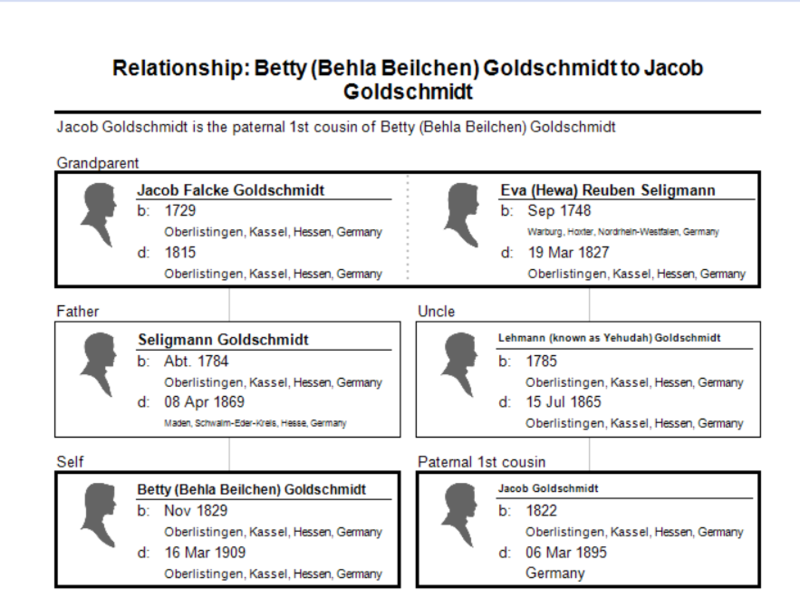 Thus, Pesach Berthold is the only child of Betty and Jacob Goldschmidt for whom I have adult records. Was he the only one to survive to adulthood? What happened to the others? I don’t know. Jacob Goldschmidt died on March 6, 1895, according to the inscription on what I think is his gravestone. 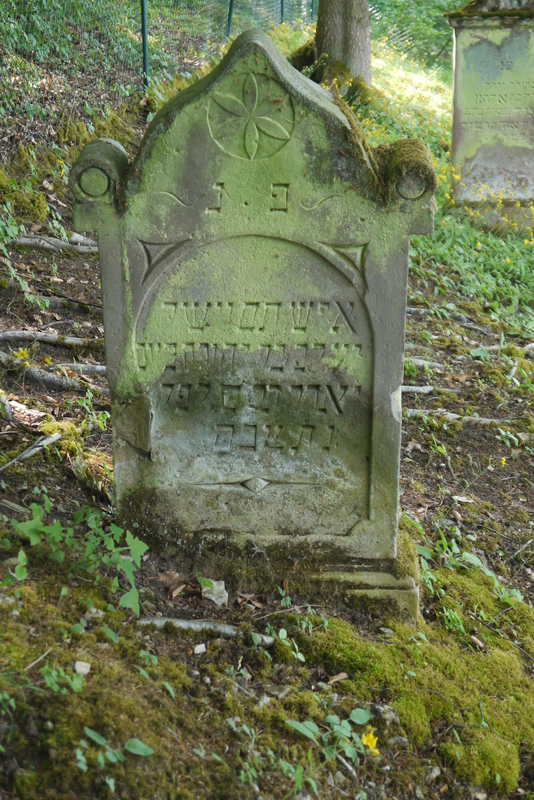 That gravestone came to my attention after my friend Julia Drinnenberg contacted me in June, 2018, asking if I knew who this Jacob Goldschmidt could be, as he was buried in the Jewish cemetery in Liebenau and there was no Goldschmidt family in Liebenau. Liebenau is almost 120 miles from Oberlistingen where my Goldschmidt family lived. Julia sent me these photographs of the gravestone. At first I did not think this was Lehmann’s son since he was referred to as son of Yehuda. But then I found a transcription of Lehmann’s grave which refers to him as Lehmann known as Yehuda. 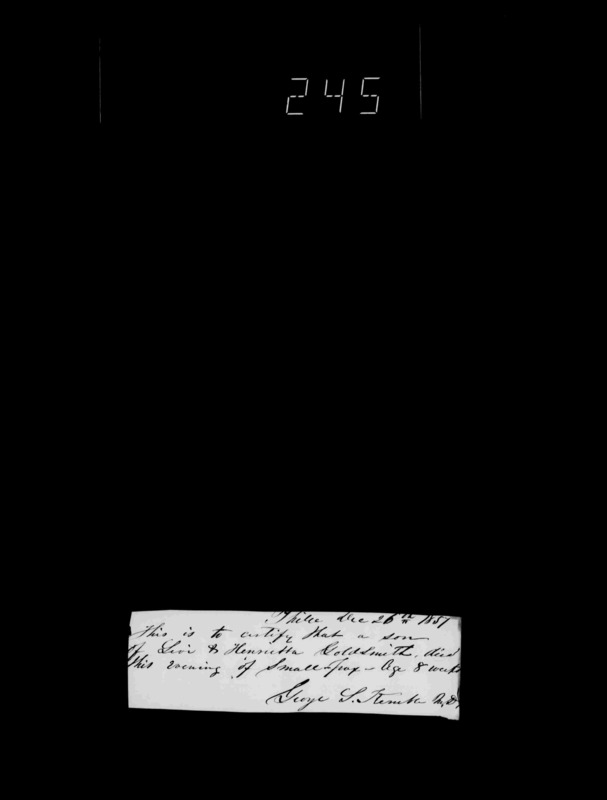 Thus, I believe that the gravestone depicted in the photographs from Julia is the gravestone of Jacob Goldschmidt, son of Lehmann and husband of Betty. What neither Julia nor I nor anyone else I consulted could understand was why Jacob Goldschmidt was buried in Liebenau when he was a resident of Oberlistingen 120 miles away. Unfortunately, neither Julia nor I could locate a death record for Jacob in Liebenau, Oberlistingen or elsewhere. Was he perhaps in Liebenau when he died? 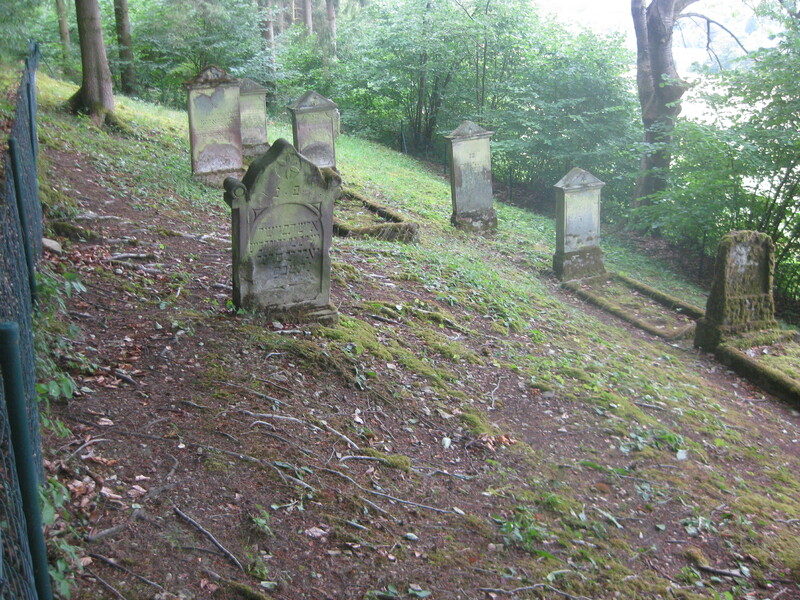 Since traditional Jewish practice required that the deceased be buried within 24 hours of death, maybe getting the body back to Oberlistingen that soon was problematic. Did he therefore have to be buried in Liebenau for religious reasons? And why was he in Liebenau in the first place? I don’t know. UPDATE: I sent this post to Julia, and she wrote back to tell me that the Liebenau where Jacob is buried is only about 6 km from Oberlistingen; apparently there are two towns with that name. So there goes my theory that they couldn’t get the body home in time to bury him in Oberlistingen…. 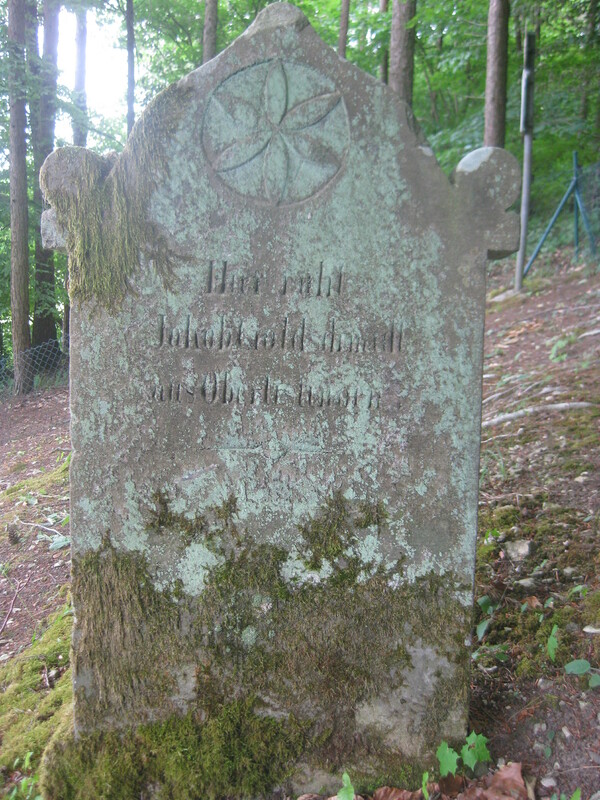 When Jacob’s wife Betty died on March 16, 1909, in Oberlistingen, she was buried in the cemetery for Oberlistingen Jews, and her gravestone inscription described her as Jacob’s widow. There is no gravestone for Jacob there. Thus, Jacob and Betty Goldschmidt were buried 120 miles apart in two different towns. They appear to have been survived only by their son Berthold, who attested to his mother’s death. Berthold’s heartbreak was only beginning in 1909. I have already told in two earlier posts the beginning of the story of Sarah Goldschmidt, my three-times great aunt and oldest child of my three-times great-grandparents Seligmann Goldschmidt and Hincka Alexander, but that was almost nine months ago. I had moved away from Sarah to tell the story of her younger siblings who had immigrated to the US thirty or so years before Sarah arrived. Now it is once again Sarah’s turn. But first a brief refresher on those earlier posts. Some of this material is covered in more depth in those earlier posts, and some is newly updated. Sarah Goldschmidt was born December 1, 1818, in Oberlistingen; she married Abraham Mansbach on October 31, 1843. 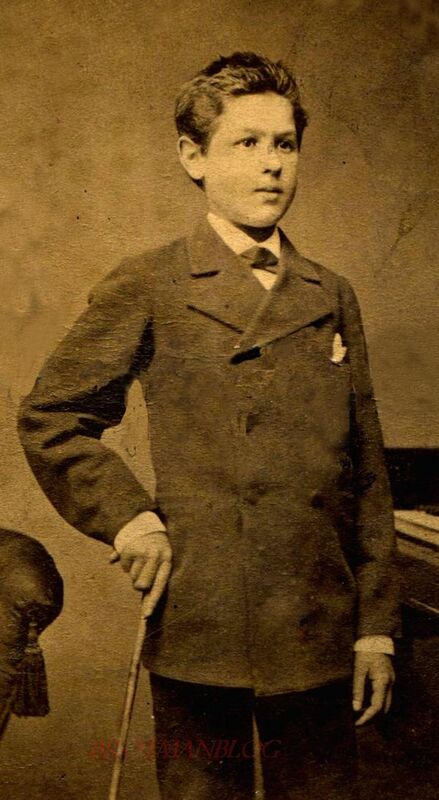 Jacob, the fourth child, born on June 23, 1851, died on September 13, 1853. He was just two years old. Hedwig was born on November 20, 1846. On February 16, 1875, she married David Rothschild of Zierenberg, Germany. Sadly, Hedwig died nine months to the day later on November 16, 1875. All but one of Sarah and Abraham’s eight other children emigrated to the United States. The one who remained in Germany was their oldest child, Breine. 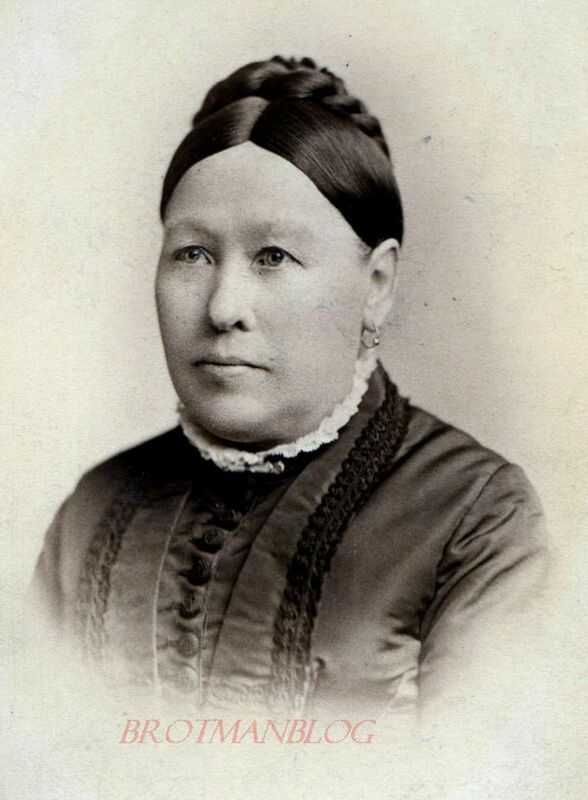 She was born on September 27, 1844, and she married Jacob Bensew on February 3, 1870; Jacob was born on January 15, 1840, in Malsfeld, Germany, the son of Heinemann Bensew and Roschen Goldberg. 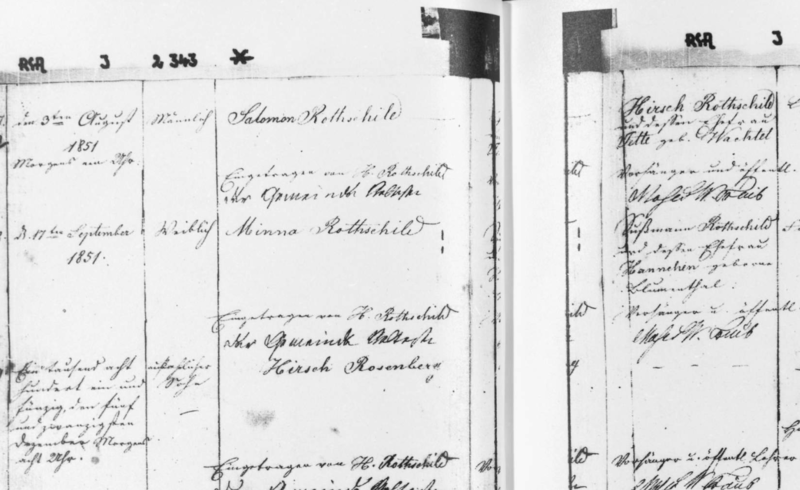 This post will now focus on the seven children of Sarah Goldschmidt and Abraham Mansbach who immigrated to the US: Louis, Amalia/Amelia, Berthold, Hannah, Meyer, Kathinka, and Julius. It was about this time that Abraham and Sarah’s older children began immigrating to the US. Although I was unable to find passenger manifests for all the Mansbach children, the earliest one I could find was for Merla/Amalie/Amelia. She was born December 10, 1853, in Maden, Germany. She (as Amalie) sailed to the US in 1872 with my great-great-uncle Henry Schoenthal and his new wife Helene Lilienfeld, as I discussed here. Berthold may have been the next child of Sarah and Abraham to arrive from Germany; he was born on February 23, 1856. 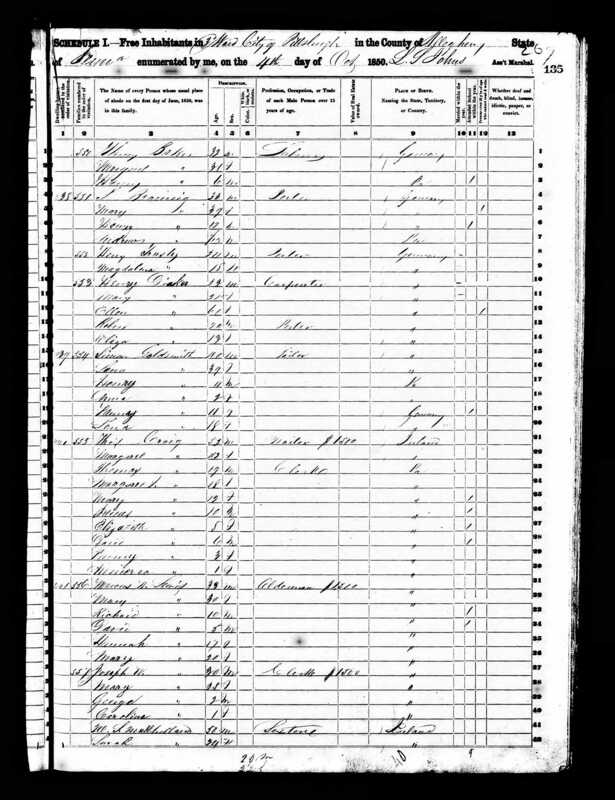 Although I cannot find a passenger manifest for him, the 1920 census reports that he immigrated to the US in 1874.6 In 1877, he is listed in the Philadelphia directory working as a clerk.7 But by 1880, he had relocated to Trinidad, Colorado, where he was living with his cousin, who was also named Abraham Mansbach and was the grandson of Marum Mansbach. Abraham was a merchant, and Bert was working as a clerk, presumably in his cousin’s store. 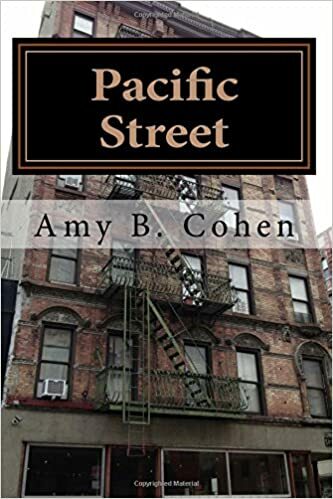 In 1880, Louis was living with my great-great-grandparents, Gerson Katzenstein and Eva Goldschmidt; Eva was his aunt, his mother Sarah’s sister. My great-grandmother Hilda, who was then sixteen, was also living at home and thus must have known her first cousin Louis quite well. Louis was 31 years old and was a veterinary surgeon. It thus seems reasonable to conclude that Hannah, Meyer, and Julius had all arrived by 1881-1882. On October 23, 1882, they were joined by their parents, my three-times great-aunt Sarah Goldschmidt and her husband Abraham Mansbach, and their youngest sister Kathinka. The next post will pick up with the Mansbach siblings and their parents between 1882 and 1900. My Uncle, The Criminal? If The Shoe Fits…. Before I turn to my three-times great-uncle Meyer and his family, I want to write about another uncle—my four-times great-uncle Simon Goldchmidt, brother of my three-times great-grandfather Seligmann Goldschmidt. 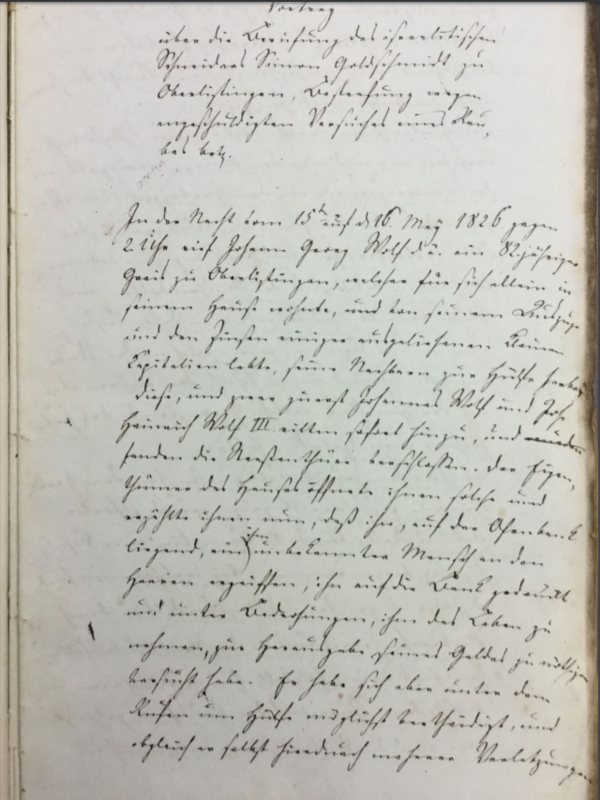 I requested a copy of the file from the Marburg archives and learned that the file covers Simon’s appeal of a ten year sentence for his criminal activity. The listing online indicates that the date of appellate decision was December 24, 1830. Well, with the help of three wonderful women in Germany, I’ve been able to obtain a copy of the report, have it transcribed, and then have it translated. First, Floriane Pfeiffer-Ditschler from the German Genealogy group on Facebook volunteered to go to the archives in Marburg and scan the entire 130 pages of the documents in the file.1 She sent it to me as a PDF, and it’s too long to post on the blog, but I will post just a few pages in this post so that you can see how difficult it is to read. If you’re interested in seeing the entire document, let me know. Neither Floriane nor I could decipher the text, so I turned to my friend Julia Drinnenberg, who had been one of my wonderful guides during my visit to Germany last year. Julia also found the handwriting difficult to read, so she recruited her friend Gabriele Hafermaas to help. Gabriele transcribed the text, which Julia then translated it into English. I cannot tell you how grateful I am to these three women for their help. It took many, many hours of work for them to produce a document that I can read. The file contained three documents: the original trial court opinion finding Simon guilty, Simon’s application for appellate review, and the appellate court’s opinion. Because the documents are quite lengthy and at times repetitive, I thought it best to write up a summary. The alleged crime took place on the night of May 16, 1826. The trial, however, did not take place until four years later. At this time we do not have any information to explain the long delay between the crime and the trial, but Julia is consulting with a judge and legal historian in Germany, so perhaps he will have some answers. The trial court reached its decision on May 14, 1830. 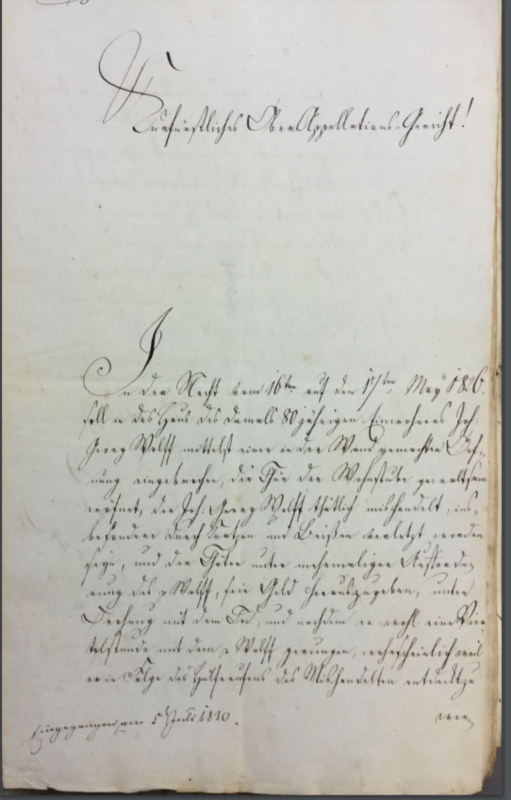 According to the trial court’s opinion, on the evening of May 16, 1826, someone broke into the home of eighty-year-old Georg Wolf, a resident of Oberlistingen. There was a hole in the wall of his home and a ladder lying on the ground in front of his sitting room. The court found that someone used violent force to break into the sitting room, using the ladder to push the door open and even breaking an iron bar that served as a lock on that door. There was a struggle between Wolf and the burglar, during which Wolf claimed he had bitten the hands of the assailant and scratched and pinched his face and neck. When neighbors heard Wolf’s cries for help, the assailant ran away. According to Wolf and several witnesses, a pair of shoes was left behind, which Wolf claimed had belonged to the assailant. Wolf described the assailant as a small and flexible man with frizzy hair, wearing a long black cape and speaking with a Yiddish accent. Based on this description, Simon Goldschmidt, a 32-year-old tailor, was thought to be the assailant, and local authorities went the next morning to his home to investigate. Witnesses testified that Simon had injuries on his face and hands that were consistent with Wolf’s testimony and that he fit the physical description provided by Wolf. Simon denied the charges and claimed that he had injured himself when he fell on a stack of logs in the corridor while going to the toilet in the middle of the night. The trial court did not find Simon’s assertion that his injuries came from such a fall credible for several reasons. The court did not find it believable that Simon had used the toilet in the corridor because he had a “night stool” in his room for bathroom use. Simon claimed he could not use the night stool because Jewish law prohibited sharing of the night stool while his wife was menstruating, but the court cited the testimony of a rabbi stating that there was no such prohibition under Jewish law. There also was no evidence that Simon’s wife was in fact menstruating at the time of the crime. Furthermore, the court found that Simon’s injuries were not consistent with falling on logs, citing the testimony of a doctor that Simon appeared to have bite marks on his hands and bruising on his face. In addition, in a page torn from Cinderella or the OJ Simpson trial, the trial court found that the shoes left behind by the assailant fit Simon as well as his wife. 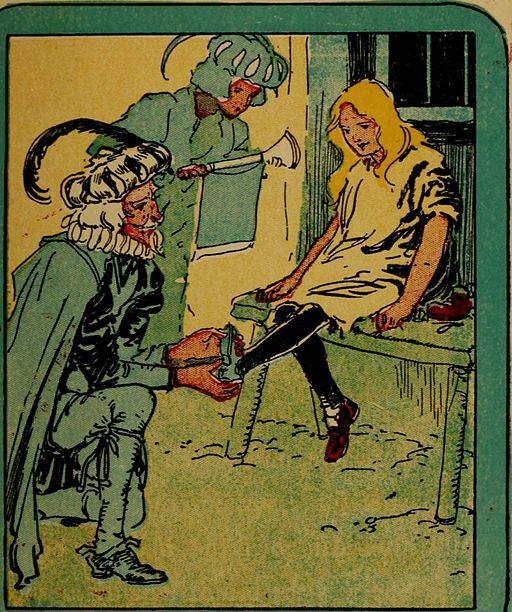 A shoemaker testified that he had made the shoes for Simon’s wife and repaired them. He was able to identify them by the way the heels were worn down on one side. Simon denied that the shoes were his or his wife’s, saying that her shoes had been stolen. The trial court did not find this assertion credible because the theft of the shoes had never been reported to the police. The fact that Simon was wearing dirty socks covered with thick straw and half-dry black mud when the authorities came to investigate was also relied on by the trial court in its analysis. Simon claimed his socks were dirty from walking inside his house and from walking outside to his well. The trial court was not persuaded, finding evidence that Simon was ordinarily a tidy man, that his floors did not have dirt like that found on his socks, and that the walkway to the well had a stone path. 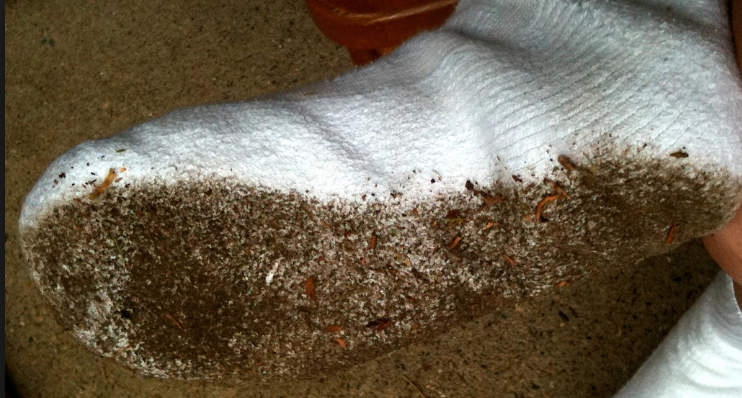 Witnesses also testified that the dirty socks were like those of someone who walked through the village without shoes. There was also some discussion in the trial court opinion about the fact that Simon had plans to go to the estate of the aristocratic von Malsburg family the morning of the investigation. Julia and I were not sure what this all meant, but as best I can tell, Simon was wearing boots when the authorities arrived and claimed it was because he was planning to go to the Malsburg estate. The court seems to have concluded that this was not the case, but that Simon had put on boots to hide his dirty socks, which were only revealed when the investigator asked him to remove his boots. Based on its evaluation of the evidence, the trial court concluded that Simon was guilty of attempted theft with burglary and attempted robbery with murder and sentenced him to ten years in prison with his legs shackled. The court considered as an aggravating factor in determining its sentence that Simon had not voluntarily called off his attempted crime, but only left because he was afraid of being caught when Wolf called for help. Although the court observed that the usual penalty for a crime of this nature would be twelve to fifteen years in prison, it noted that the case had been delayed for two years due to an overload of pending cases and therefore reduced the usual penalty and sentenced Simon to ten years in prison. The court’s mention of a two-year delay is confusing since the crime was in 1826 and the trial decision in 1830. Simon had been incarcerated for four years while awaiting trial. On July 22, 1830, Simon appealed the trial court’s verdict, making many of the same arguments that he made at trial, but with some additional details. For one thing, he claimed that he had not reported the theft of his wife’s shoes because of their low value. As to the fact that he was wearing boots the morning after the crime, he asserted that it was insulting to claim that a tailor would not ordinarily be wearing shoes. 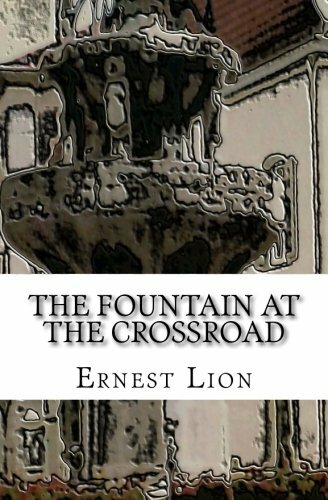 With respect to his dirty socks, Simon asserted that the stones on the walkway to the well were quite distant from each other and that the humid weather had made the ground very muddy. And as for his claim that he injured himself from a fall when he went to the toilet in the corridor, he asserted that he left the bedroom because he did not want to make a stench inside and that he believed, even if incorrectly, that under Jewish law he and his wife could not share a night stool while she was menstruating. Simon also pointed out that Wolf had not specifically identified him, but had only given a general description of the person who attacked him. In addition, Simon asserted his overall good reputation as a factor mitigating against his guilt. The appellate court issued its decision on December 24, 1830. Its opinion is far more detailed and thorough than the trial court opinion and raises some additional issues. For example, the appellate court pointed out that Simon had been having financial problems and thus had a motive for stealing from Wolf. The court also mentioned that Simon knew that Wolf had money because he and his brothers had at one time borrowed money from Wolf. Simon’s response was that his financial problems were only temporary and that everyone in the village knew that Wolf had money and might have stolen from him. Simon also argued that since Wolf had loaned money to him and his brothers, it would not make sense for him to steal from him. The court concluded that the evidence of Simon’s financial problems supported the trial court’s guilty verdict, although only circumstantially. The appellate court also considered Wolf’s description of his assailant and whether it clearly identified Simon. Despite some inconsistencies in the evidence regarding the description of the assailant’s “singing voice” and hair, the court found that this evidence nevertheless pointed towards Simon’s guilt. With respect to the fact that Simon was wearing boots when the authorities came to investigate early on the morning after the crime, the court found that it was not Simon’s usual practice to wear boots and that his story that he was planning to walk to the Malsburg estate was not supported by any witnesses. But the court considered this only relevant to the claim that Simon was trying to hide the dirt on his socks. The evidence that the appellate court seemed to consider most persuasive of Simon’s guilt was the evidence relating to the shoes left at Wolf’s house and the dirt on Simon’s socks. In the court’s weighing of the evidence, it concluded that the shoes belonged to Simon and his wife and that he got his socks dirty when he ran home through the town without his shoes. The appellate court also considered very persuasive the evidence of Simon’s injuries and concluded that Simon’s story about falling on logs was not credible. In response to the assertion that Simon did not use the night stool because his wife was menstruating, the prosecution argued that Simon’s wife could not have been menstruating because she was breastfeeding [presumably Jakob, their first child born in 1825]. I was impressed by the court’s response to this assertion—that women can menstruate even while breastfeeding—because that is a fact that I would not have thought was commonly known in 1830. But the court nevertheless found that it was not likely that Simon’s injuries were sustained in a fall, given the doctor’s testimony that there were bite marks and the fact that the injuries were in multiple locations on Simon’s body, not on one side as one would expect from a fall. Also, Simon couldn’t give a convincing description of the fall and refused to show his injuries. Thus, the court dismissed Simon’s assertion that he was injured in a fall. After weighing all the evidence, the appellate court thus upheld the verdict. However, it reduced the sentence from ten years to four years because Wolf’s injuries were not dangerous or life-threatening and because Simon had not used any lethal weapons. It thus reduced the original charges against Simon to attempted robbery. The court also observed that the delay in trial was not Simon’s fault and took that into consideration in reducing his sentence. Simon was released from prison after the appellate court’s decision. As noted in my earlier post, Simon’s first wife Eveline died in 1840, and in 1844 my four-times great-uncle Simon Goldschmidt married Fradchen Schoenthal, the sister of my great-great-grandfather Levi Schoenthal and thus my three-times great-aunt. Fradchen and Simon left for the United States not long after. 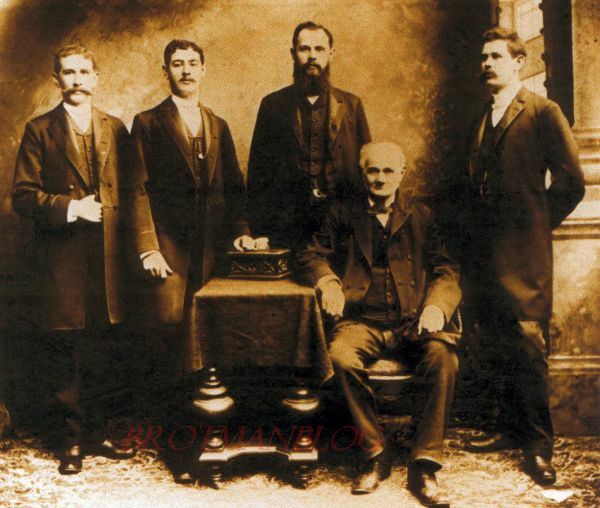 Simon was the second member of the Goldschmidt family to immigrate to the US, following his oldest son Jakob, and Fradchen was the first Schoenthal to immigrate. Ancestry.com. 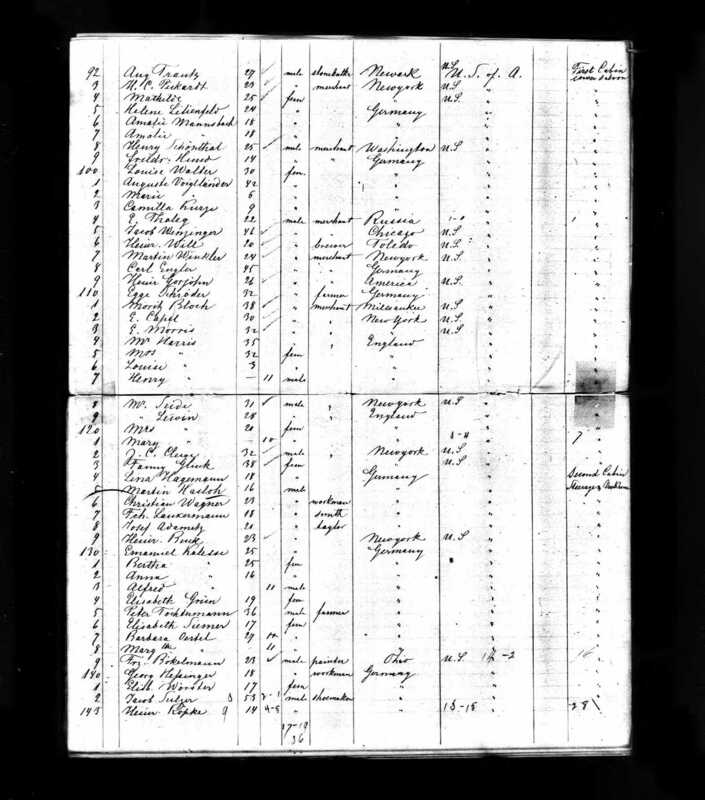 Baltimore, Passenger Lists, 1820-1964. 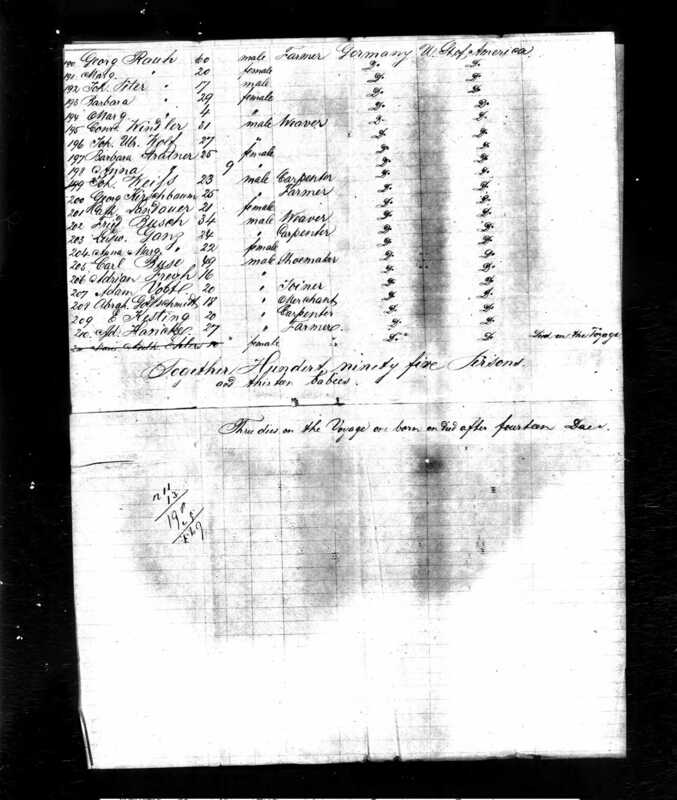 Original data: Selected Passenger and Crew Lists and Manifests. National Archives, Washington, D.C. I can’t help but wonder whether their decision to leave Germany was in some part motivated by a desire to leave behind Simon’s criminal past and start over in a new country. If so, well, then I have to say that I am awfully glad that Simon was convicted of this crime because in many ways it was that event that led ultimately to the emigration of my great-great-grandmother Eva Goldschmidt Katzenstein (Simon’s niece) and my great-grandfather Isidore Schoenthal (Fradchen’s nephew), who later married Eva Goldschmidt’s daughter, Hilda Katzenstein. 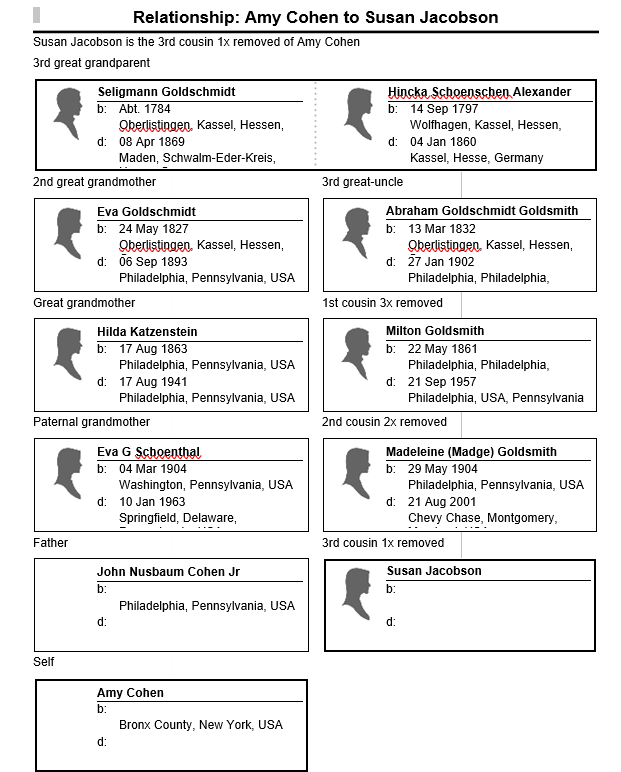 Thus, in some ways Simon’s crime may have led to the merging of three of my paternal family lines—Goldschmidt, Schoenthal, and Katzenstein—in America. How very strange. In my last post we saw how my three-times great-uncle Jacob Goldsmith came to the United States and settled in Philadelphia by 1850, then married and had seven children in the 1850s and 1860s. He also established a retail clothing business on Market Street. On January 17, 1858, he married Cecelia Adler in Philadelphia. Cecelia was the daughter of Samuel Adler and Sarah Kargau, and she was born on November 26, 1838, in Würzberg, Germany. She and her parents had immigrated to the US by 1850 and settled in Philadelphia where her father was a merchant. In 1860, Abraham and Cecelia were living in Philadelphia, where Abraham was a clothier with $15,000 worth of personal property. That he amassed that much money so quickly indicates to me that he must have been either a very successful business person, or either his parents or his in-laws provided a substantial financial cushion. Note that Abraham, like his brother Jacob, had Americanized his name from Goldschmidt to Goldsmith. Abraham and Cecelia had six children between 1861 and 1870: Milton (1861), Hildegard (1862), Edwin (1864), Rose (1866), Emily (1868), and Estelle (1870). In 1870, Abraham now claimed he had $25,000 worth of real estate and $20,000 worth of personal property. He continued to be in the clothing business. 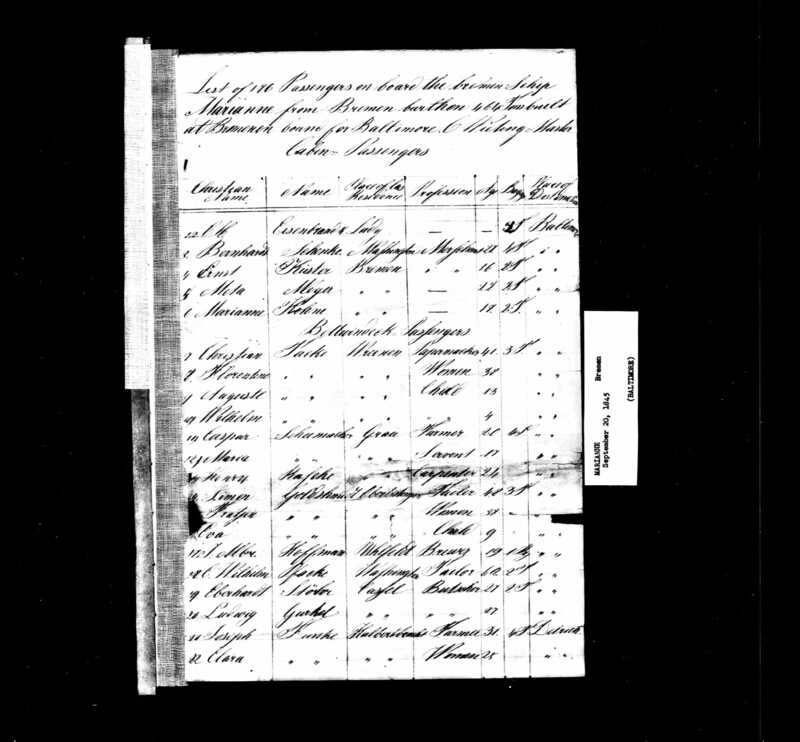 Cecelia’s parents were also living with Abraham and Cecelia and their six children in 1870, as well as three domestic servants [shown on the next page of the census]. Thus, like his older brother Jacob, Abraham was quite well-settled in Philadelphia by 1870. The youngest son of Seligmann and Hincka, Meyer, was the third brother to immigrate. He was born October 25, 1834, apparently registered with the name Rafael. 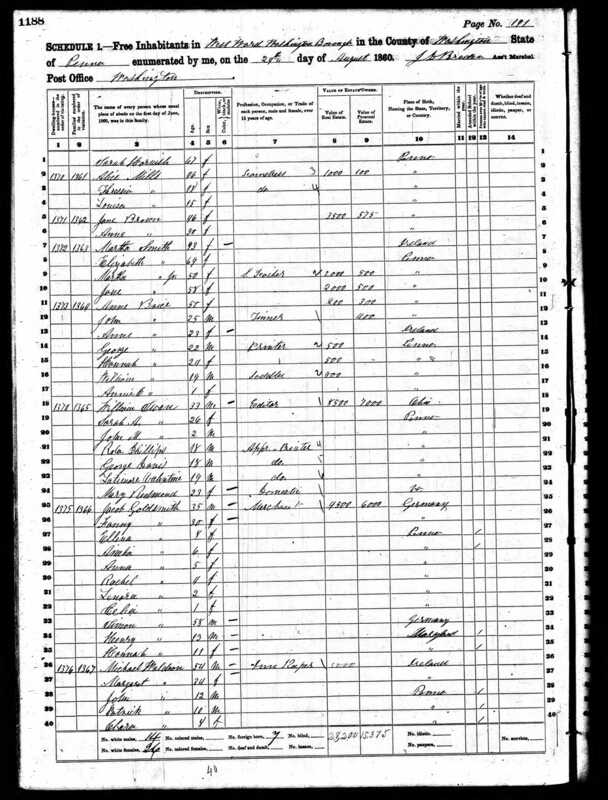 I still believe that this was the same child later known as Meyer, based on his age on several US records and the fact that the 1900 census says that he was born in October 1834, and there is no other birth registered to Seligmann Goldschmidt and Hincka Alexander for that month and year. Meyer arrived in the US on July 8, 1852. He was seventeen years old. 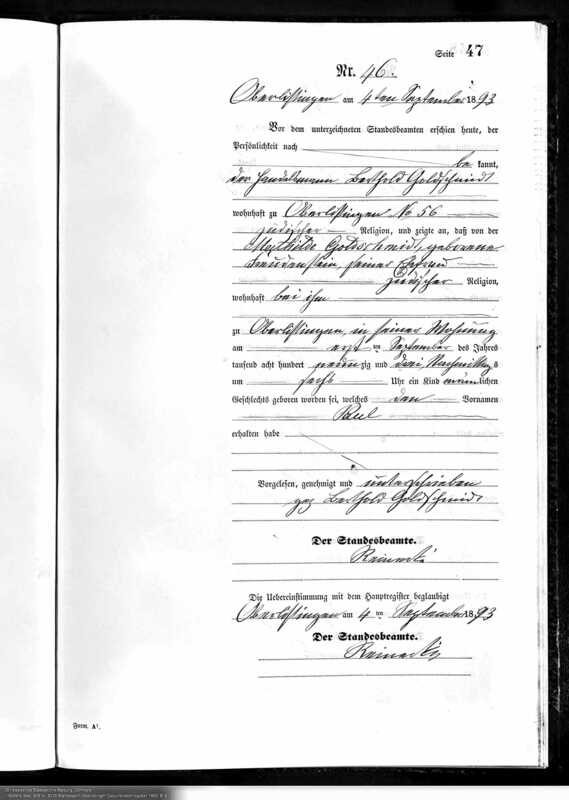 According to the 1900 census, in 1859, Meyer married Helene Hohenfels, daughter of Jordan and Adelaide Hohenfels, all of whom had emigrated from Germany to the US by 1850. Meyer and Helene’s first child Eugene was born on October 6, 1859, in Newton, New Jersey, which is about 100 miles north of Philadelphia and sixty miles west of New York City. In 1860 Meyer, Helene, and Eugene were living in Newton; Meyer was working as a “merchant tailor” and had $4000 worth of personal property. Also living with them were a servant and a thirteen year old boy named George Stone from the Hesse region, whose relationship to the family I’ve not determined. Like Jacob and Abraham, Meyer had changed the spelling of his surname to Goldsmith. By 1863 or so, Meyer and his family had relocated to Philadelphia where his siblings were living. 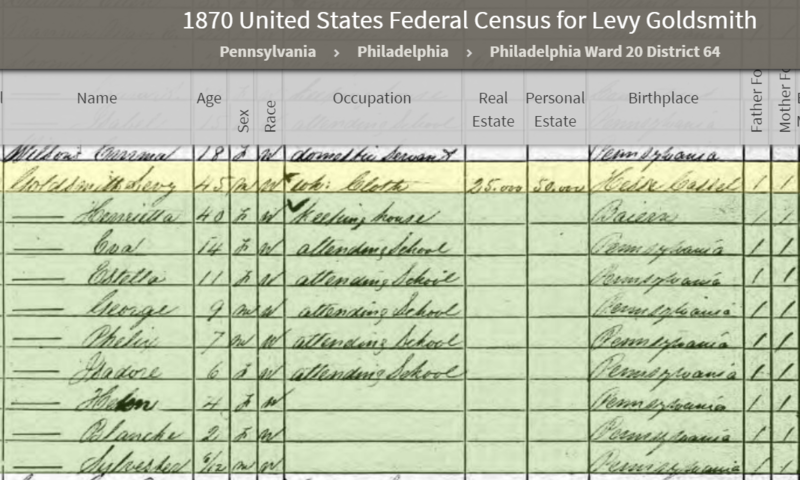 On the 1870 census, you can see that while his first two children were born in New Jersey, the third, who was seven in 1870, was born in Pennsylvania. By 1870 Meyer and Helene had five children: Eugene (1859), Heloise (1860), Maurice (1863), Samuel (1867), and Rosa (1869). Meyer was working as a wholesale clothier and claimed $2000 in personal property. (I guess all those children ate into the $4000 worth of savings they’d had in 1860!) A sixth child, Florence, would be born in 1872. 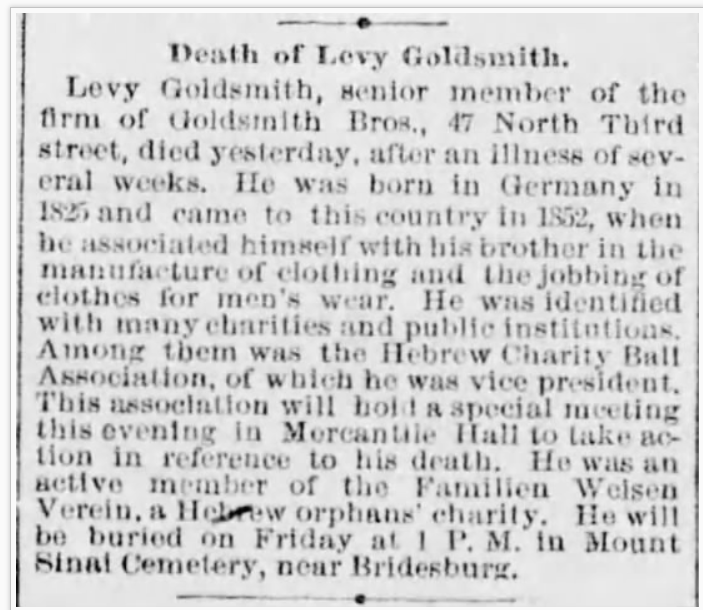 Levy, the second oldest son of Seligmann and Hincka, was the next to come to the US. He was born November 10, 1824. He arrived in the US on September 20, 1853, and also settled in Philadelphia. 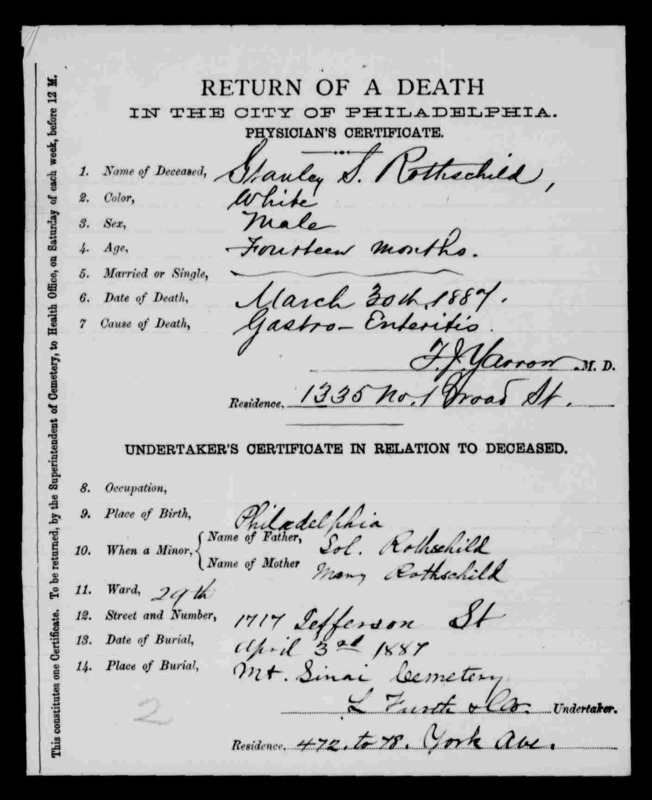 Two years after arriving he married Henryetta Lebenbach in Philadelphia on March 21, 1855. In 1860, they were living in Philadelphia with two daughters, Eva (1856) and Estella (1859). He claimed $7,000 worth of personal property, and like his brothers, was now using the surname Goldsmith. Interestingly, he also seems to have changed the spelling of his first name from Levy to Levi. It looks like Henryette had also adopted a new spelling of her name—Henrietta. Levi was, like his three brothers, in the clothing business. 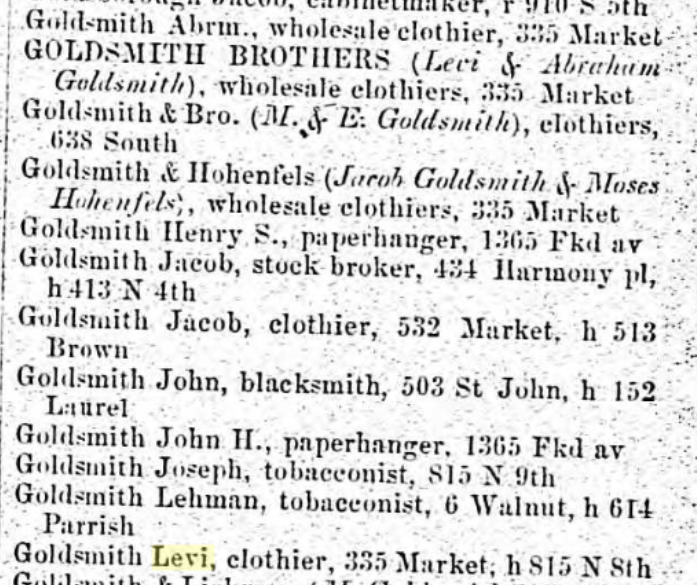 A search of the Philadelphia directories for these years revealed that at least Abraham and Levi were in business together. I say “at least” Abraham and Levi were in business together because I think it’s possible that Jacob was also in the same business. 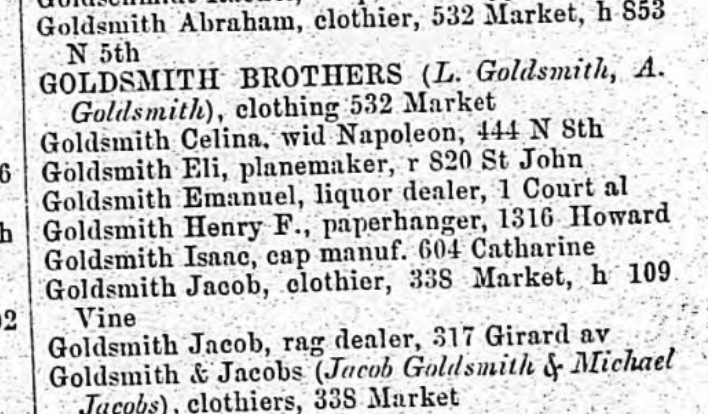 If you compare these two directory listings, one in 1862, one on 1866, you can see that whereas in 1862 Jacob was at 335 Market Street and Levi and Abraham at 532 Market Street, in 1866 they’d reversed—Jacob was at 532 and Levi and Abraham at 335. By 1870, Levi (here spelled Levy) and Henrietta had seven children. After Eva and Estella came George (1861), Felix (1862), Helen (1865), Blanche (1868), and Sylvester (1869). Levy reported that he was in the wholesale clothing business and that he had $25,000 in real estate and $50,000 in personal property. He obviously was doing quite well. Although by 1853, all four sons of Seligmann Goldschmidt and Hincka Alexander had thus left Germany for the United States, their four sisters—Sarah, Bette, Eva, and Rose—were still in Germany at that point. But soon enough two of them also would come to the US. 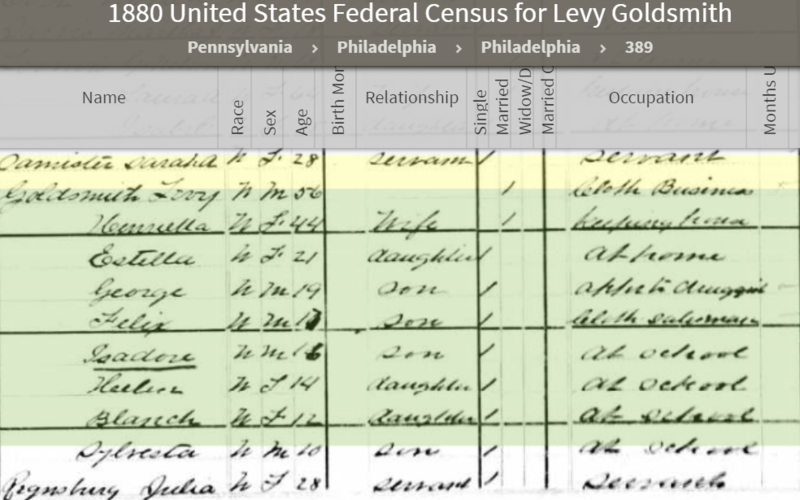 In 1856 my great-great-grandmother Eva Goldschmidt arrived with her husband Gerson Katzenstein, and they, too, settled in Philadelphia, as I’ve written about previously. They came with their three oldest children: Scholum (1848), Jacob (1851), and Brendina (1853). And as noted before, traveling with them were some of the children of Gerson’s sister Hannchen Katzenstein Mansbach, who were also cousins to the children of Eva Goldschmidt’s sister Sarah Goldschmidt Mansbach. As already described, Eva and Gerson would have three more children in the US: Perry (1856), Hannah (1859), and my great-grandmother Hilda (1863). Seligmann and Hincka’s youngest child, Roschen or Rosa, was born on October 27, 1837. Thus, by 1860, all but two of Seligmann and Hincka’s children had emigrated to the US, and by 1870, those in the US were all living in Philadelphia and married with children; all the sons were working in the clothing industry. Only two siblings were still in Germany: Sarah, the oldest daughter, and Bette/Biele. After 1870, the children of Sarah Goldschmidt and her husband Abraham Mansbach II would also begin to emigrate, followed by Sarah and Abraham themselves in 1882, as discussed in my next post. As I mentioned in my last post, my three-times great-grandparents Seligmann Goldschmidt and Hincka Alexander had seven children. Their oldest child was Sarah, born December 1, 1818, in Oberlistingen. Sarah married Abraham Mansbach on October 31, 1843. 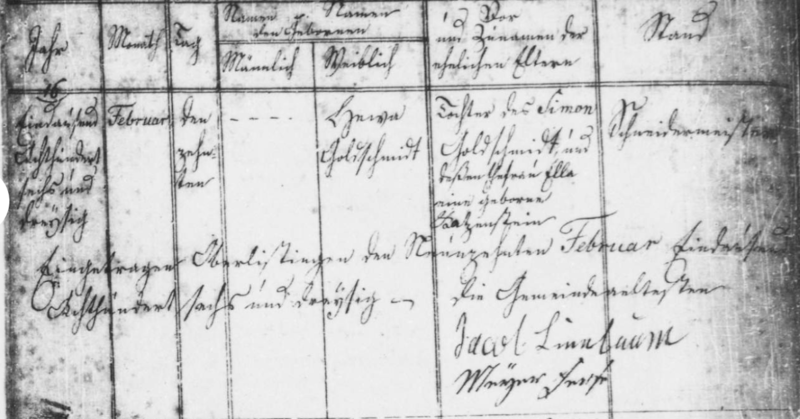 Abraham Mansbach was a name I’d encountered before when researching my Katzenstein relatives, so I knew I had to dig deeper to see if there was a connection. Back in November, 2016, I wrote a post entitled “Will the Real Abraham Mansbach Please Stand Up?,” in which I described my attempts to distinguish five different men (all related to each other) named Abraham Mansbach. The first Abraham Mansbach (Abraham I) died around 1808; the other four included one of his grandsons and three of his great-grandsons. Abraham I had three sons: Isaac, Leiser, and Marum I. Leiser in turn had two sons, Abraham II and Marum II, both of whom married into my family. Abraham II married my three-times great-aunt Sarah Goldschmidt, as seen above. 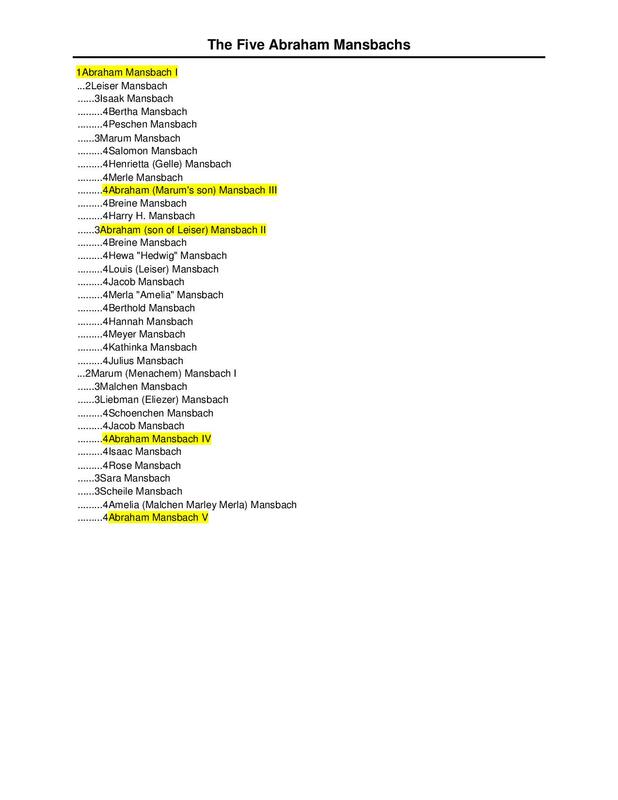 Marum Mansbach II and Hanchen Katzenstein also had a son named Abraham, whom I labeled Abraham Mansbach III. The fourth and fifth Abraham Mansbachs were other great-grandsons of Abraham I not directly entangled with my relatives. 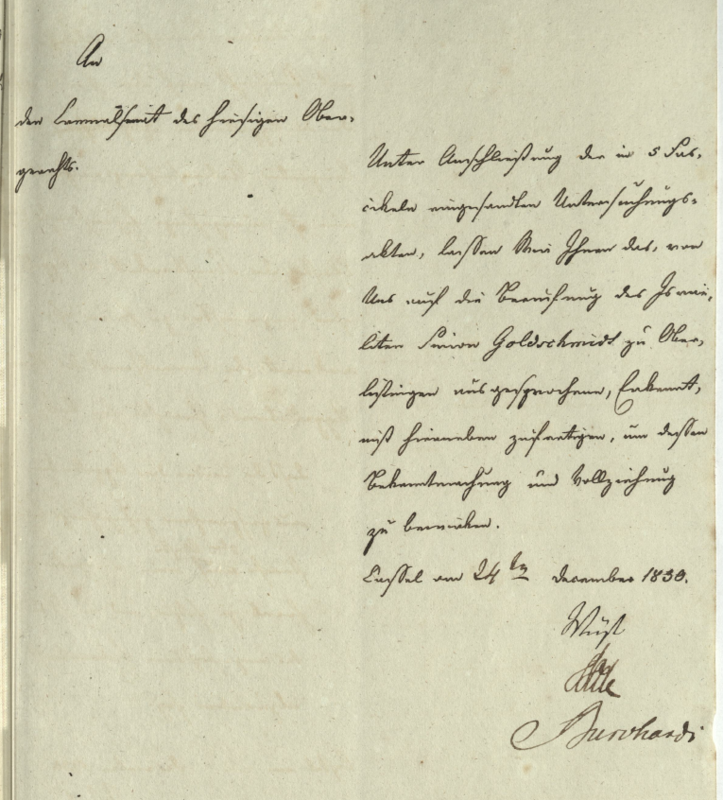 Anyway……all you need to know for this post is that Sarah Goldschmidt married Abraham Mansbach II, who was born January 12, 1809, in Maden, Germany. 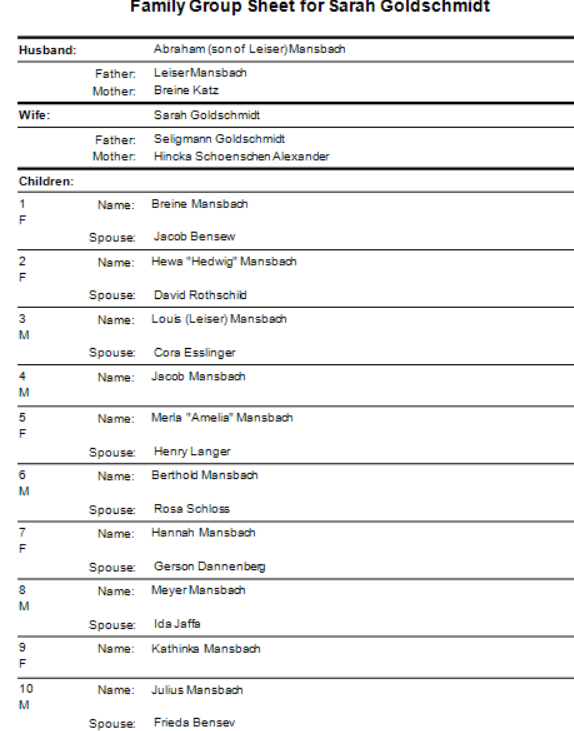 Sarah and Abraham had ten children: Breine (1844), Hewa “Hedwig (1846), Leiser “Louis” (1849), Jacob (1851), Merla “Amelia” (1853), Berthold (1856), Hannah (1858), Meyer (1860), Kathinka (1862), and Julius (1865). In other words, Sarah gave birth to ten children over a 21 year period. All the children were born in Maden. Remarkably, only one of those children did not grow to adulthood. Jacob, the fourth child, who was born on June 23, 1851, died on September 13, 1853. He was just two years old. Two other children of Sarah and Abraham II predeceased one or both of their parents, but did live to adulthood: Hedwig and Kathinka. Kathinka died in the US, so her story will come in a later post. But Hedwig died in Germany. Hedwig was born on November 20, 1846. On February 16, 1875, she married David Rothschild of Zierenberg, Germany. Sadly, Hedwig died nine months to the day later on November 16, 1875. Had she died in childbirth? I don’t know. She was only 28 years old when she died. If there was a child, I have not found any record of him or her, and I checked all the births and deaths in Zierenberg in 1875. Not long after Hedwig’s death, many of her siblings began to leave Germany for the United States. In fact, all but one of the remaining siblings and their parents Sarah and Abraham themselves eventually emigrated. I will continue their stories in subsequent posts. 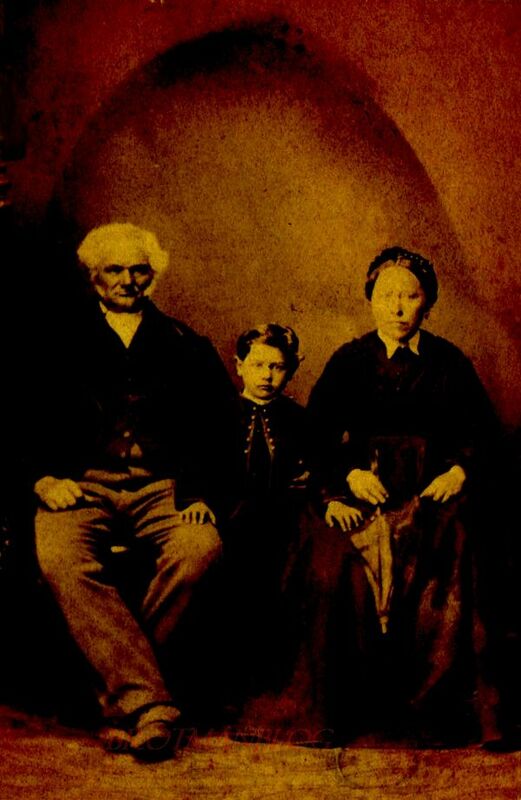 The only surviving child of Sarah and Abraham who did not emigrate was their first-born child, Breine. 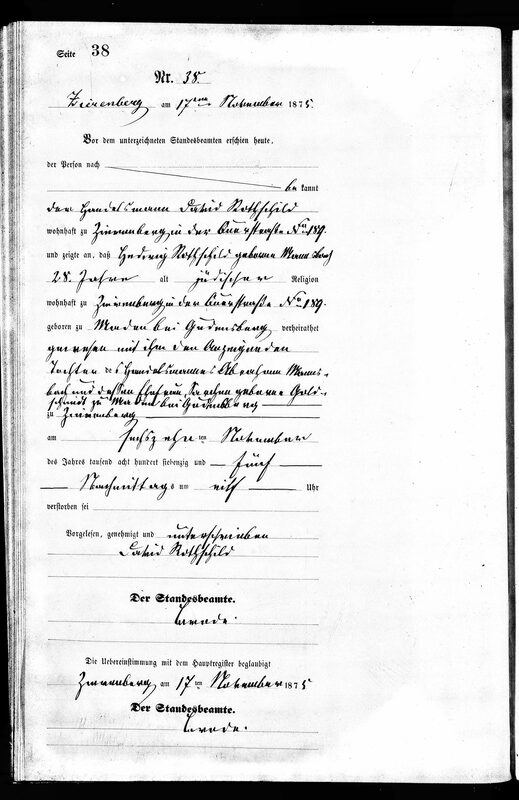 She married Jacob Bensew on February 3, 1870; Jacob was born on January 15, 1840, in Malsfeld, Germany, the son of Heinemann Bensew and Roschen Goldberg. 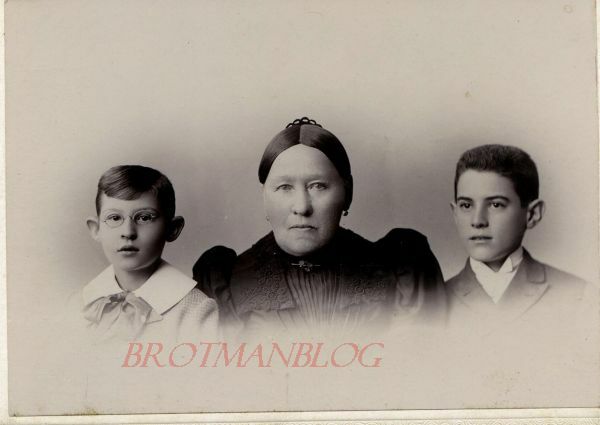 Breine and Jacob had six children—five sons and one daughter: William (1872), Julius (1875), Siegmund (1877), Heinemann (1879), Max (1882), and Frieda (1886). All six of their children would eventually immigrate to the United States, but Breine and Jacob stayed behind and lived the rest of their lives in Germany. Breine died in Melsungen, Germany, on May 31, 1922, and her husband Jacob in Kassel, Germany, on April 25, 1925. 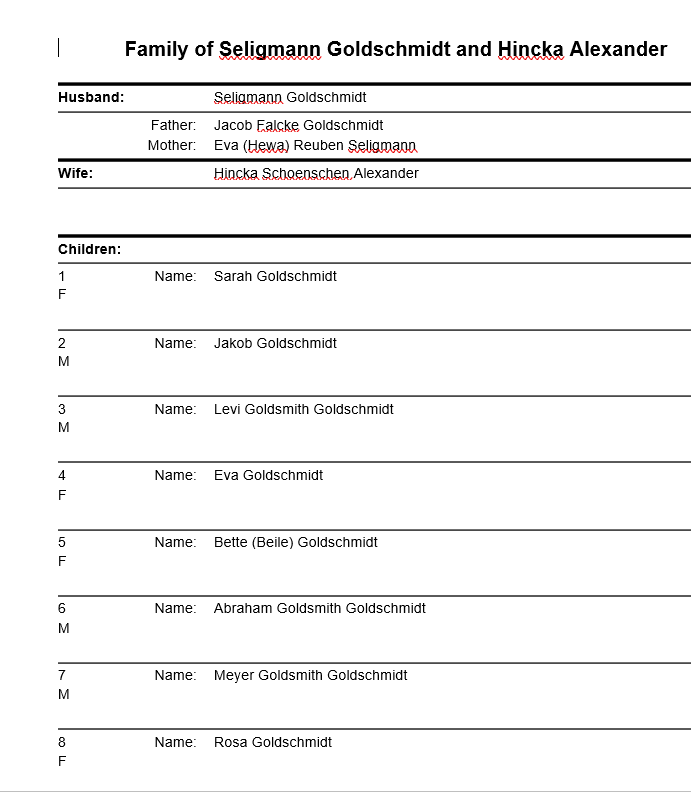 Because so much of the rest of the story of the the family of Sarah Goldschmidt and Abraham Mansbach II took place in the US, I will stop here and address the history of the Goldschmidt family’s migration to the US in my next post. Thus, Abraham II was the uncle of Abraham III, my first cousin-three times removed on my Katzenstein line, and he was the husband of my three-times great-aunt Sarah Goldschmidt.